The Park was established in 1992 and is located just outside Alice Springs in the West MacDonnell Range of Northern Territory. It will only take you 15 minutes to drive to the entrance of the park. As Alice Springs is small and remote Outback town, you will be in the wilderness as soon as you are out of town and in the park. Visiting is definitely a true Outback experience even though civilization is pretty close when you are in the eastern part of the park. The further west you go, the more remote it will get and you will actually get quite far into the wilderness. You have several options of exploring the park. You can do day hikes of specific parts or you can visit a couple of major attractions that can be experienced without doing big hikes. 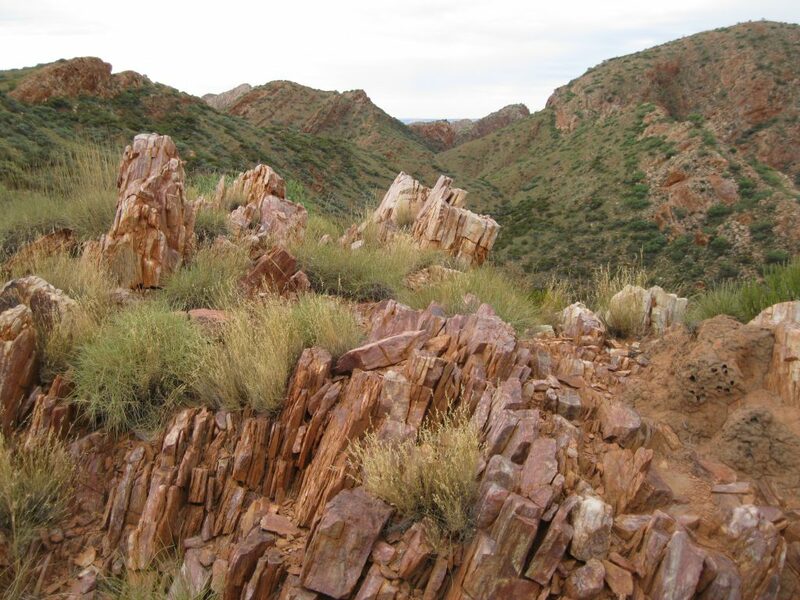 As you are exploring and hiking around the West MacDonnell Ranges, you will be walking around on ancient rocks known as gneiss, that are 1.8 billion years old. They have melted, crystalised, cooked and twisted giving them the characteristic lumpy banded look. You will find hardened sand layers on ridge tops called quartzite, which were part of a beach the sea created 900 million years ago. 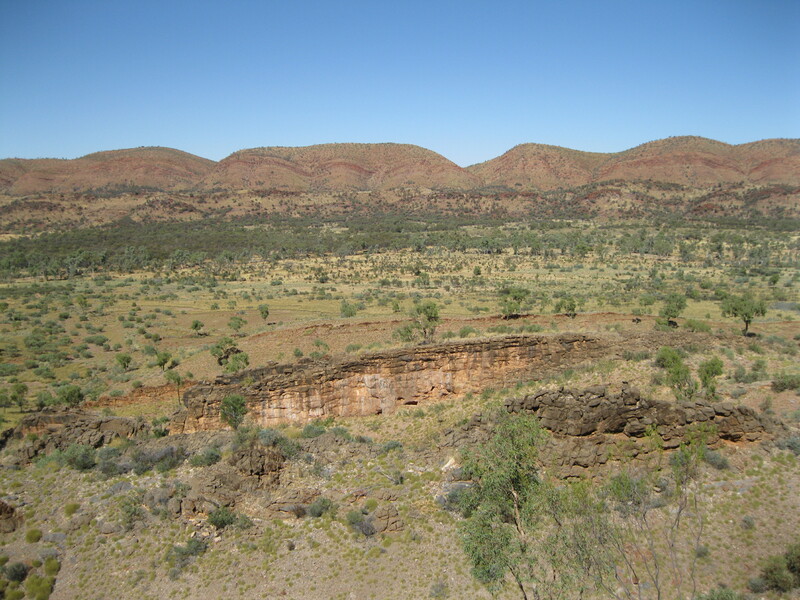 From around 300-400 million years ago massive pressure occurred in the earth of central Australia. 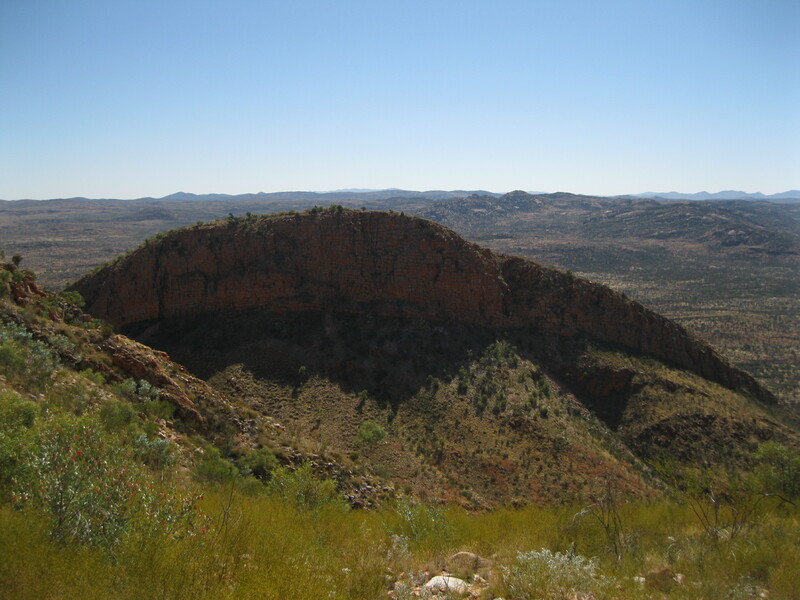 The landmass changed shape which sculpted a great curve seen in the Heavitree Range to the Rungutjirba Ridge. The quartzite of the old beach had risen to great heights. In the intervening 300 million years the acts of wind, water, fire and ice have been a part of creating the landscape seen today. 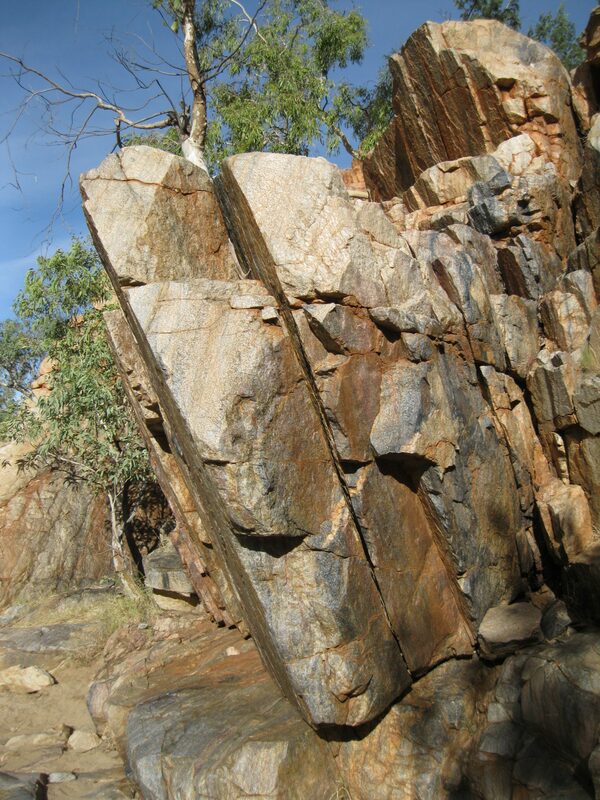 At the top of the range the quartzite has remained due to its resistance to erosion. Some of the sections below will touch more on the geology of the specific areas of the park which is relevant to the particular section. You will most likely spot some interesting wildlife while exploring the West MacDonnell National Park. 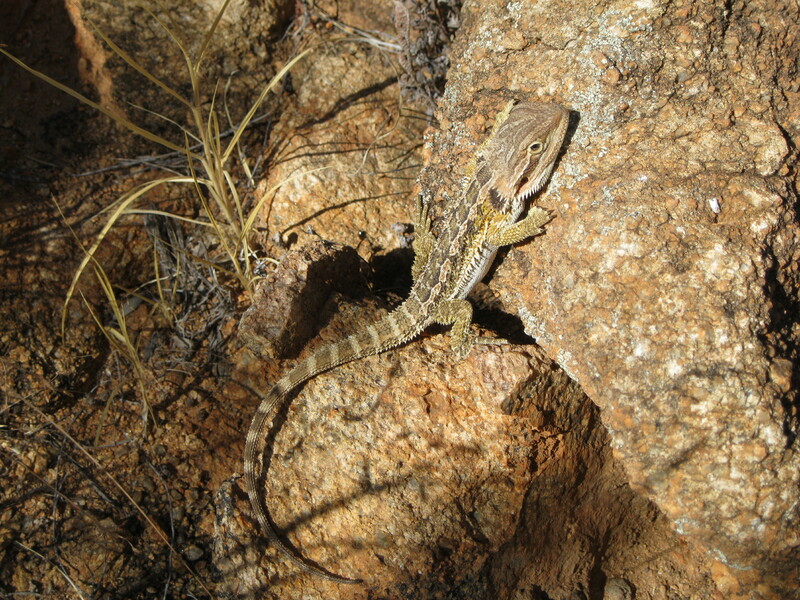 Several reptiles and lizards roam the ranges such as the Bearded Dragon and the Central Military Dragon. If you are lucky you may spot a Perentie, the second largest dragon in the world. In the beginning of section 1 of the Larapinta Trail you may see wallaroos and rock wallabies in certain areas such as at Simpsons Gap or at Ormiston Gorge. Furthermore you may encounter dingoes or hear them howl at night. If you experience the latter it will just enrich your authentic Outback venture. So awesome. There are 160 bird species in the park such as Spinifex Pigeons and Western Bowerbirds which are quite common. White-necked herons and zebra finches may just be spotted at different waterholes such as Ellery Creek Big Hoe, Davenport Creek or the Finke River. There is an abundant plant life in the park. 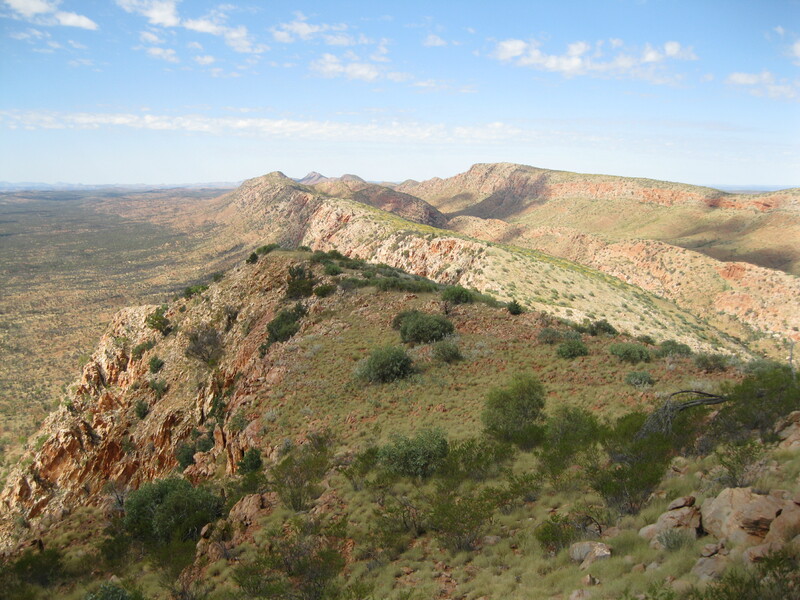 The eucalypt and acacia trees dominate the lowlands while mulga and spinifex are present on the rugged slopes. Buffel grass is all over the park and is an introduced species. From a distance it looks similar to the spinifex. There are some awesome native plants such as the fern-looking MacDonnell Ranges Cycad, the white-barked ghost gum, the desert rose and the curry wattle to name a few. Up to 40 species can be traced back to when central Australia was covered by a lush rainforest which includes the MacDonnell Ranges Cycad. In the sections below certain animals and plants will be cover in further detail. 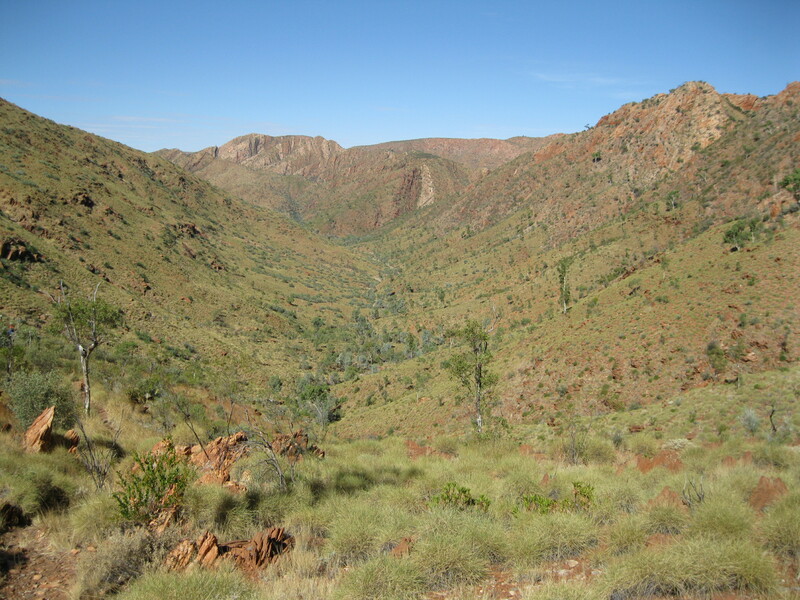 The source of the Finke River is the MacDonnell Ranges and begins at the confluence of the Davenport and Ormiston Creeks just north of Glen Helen. As this was the source of life in the area there is a lot of interesting history associated with it. The Finke River is the heart of the largest drainage system of central Australia creating life in an area where rainfall is uncertain and drought is almost always sets in. The river crossed plains and rugged mountain ranges for nearly 700 km (437.5 miles) before heading into desert lands. The Finke River has often been referred to being the oldest river in the world. It has been following the same course for around 100 million years. 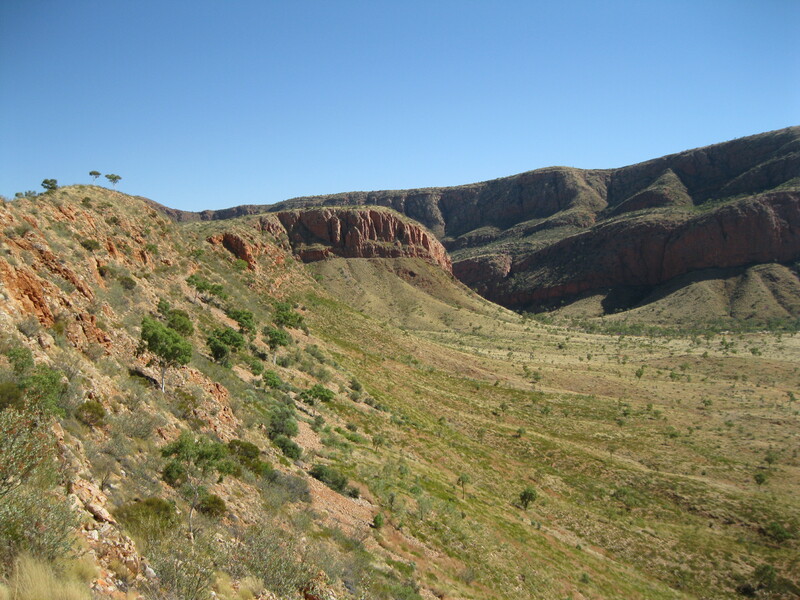 Originally the land surface was a lot higher with the river flowing along a shallow valley above Glen Helen Gorge. About 15 million years ago the earth’s movements made the landscape tilt to the south making the erosive powers stronger which lowered the land and carved out the present gorge. 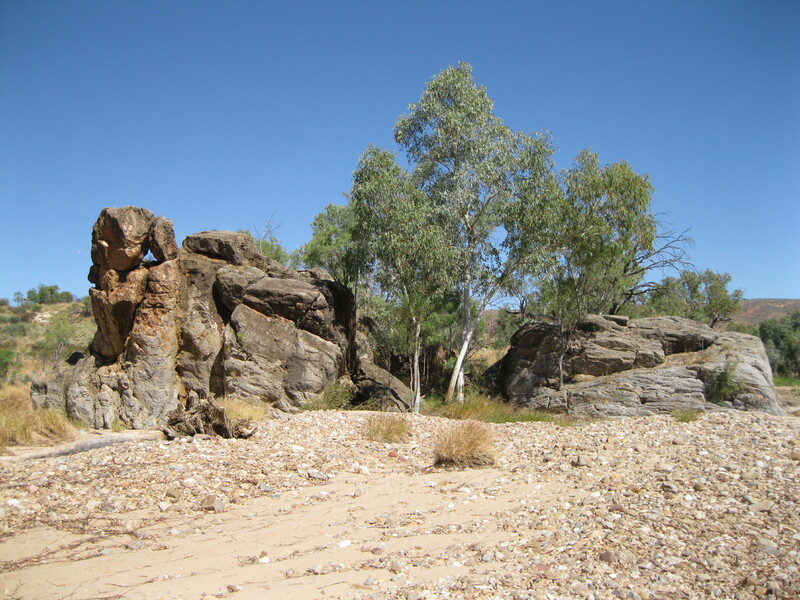 The River and the permanent waterholes were used by the Aboriginals during droughts and especially the waterhole at Glen Helen Gorge was a refuge. The waters also made the Finke a vital network of trade routes that would enable pearl shells from the Kimberley and ochre from the Flinders Ranges to reach central Australia. To the western Aranda people the Finke is known as “Lhere Pirnte” which is pronounced “lara pinta”. This means salty river referring to the saltiness of the river water. John McDougall Stuart and his exploration party were the first white men to visit central Australia. Stuart reached the river in 1860 and named it in honour of the South Australian colonist William Finke. In the 1870s the Finke River became a major trade route for the early settlers as the floodplains were considered to be first-rate cattle land and soon pastoral lease would be spread out along its entire length. 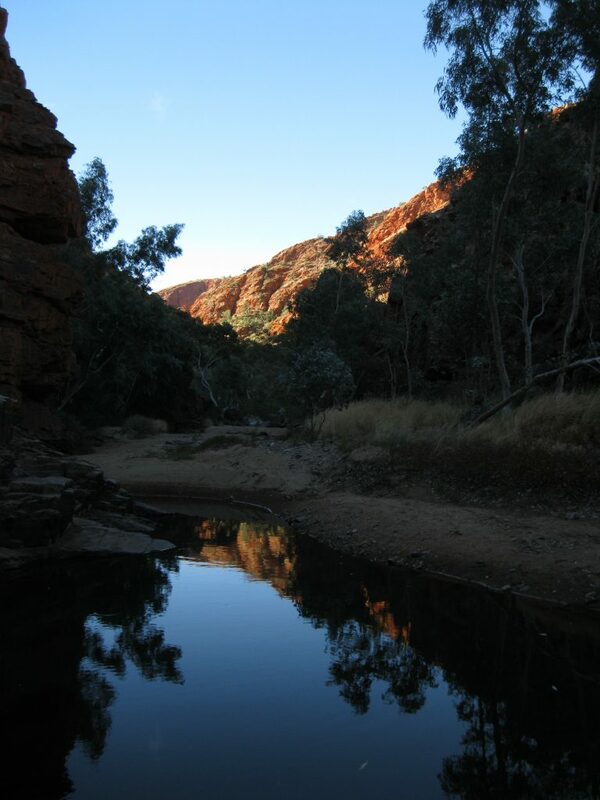 The Glen Helen waterhole was the first to be used as a watering point on the route in the 1880s and was an important water source until the use of bore water. 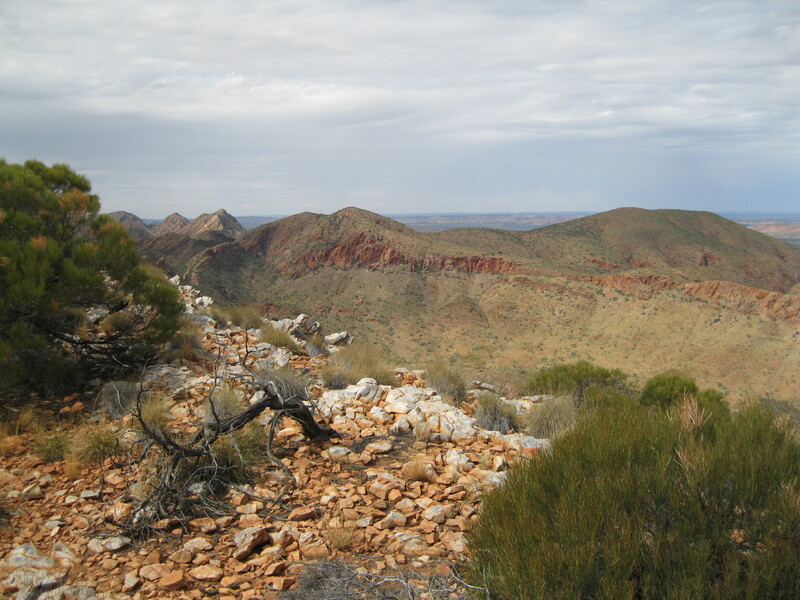 The most of the hiking trails in the park are a part of the Larapinta Trail. There are 12 sections to this trail but you can chose to only do parts of it if you want. It is an awesome hike so it is highly recommended that you do it as a whole from end to end. 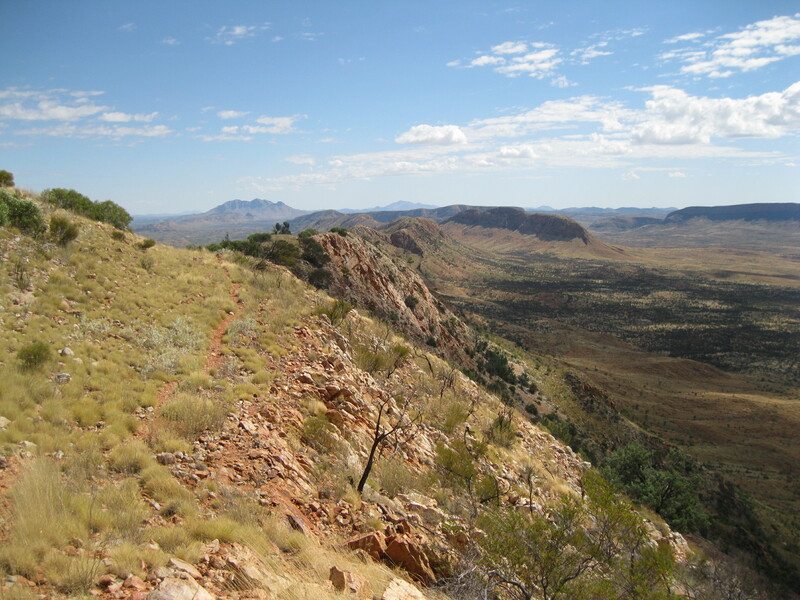 The doing the full Larapinta Trail is a big hike of totally 231 km (144 miles) but you can do it at your own leisure. Some do it over 14, 16 or even 21 days. If you do the trail from the east towards the top of Mt Sonder where it officially ends, it is 223 km (139 miles) but you have to get off the mountain again which is a return trip of 8 km (5 miles), so therefore totally 231 km (144 miles). The sections on the trail have different levels of difficulty. The official definitions have to be taken with a grain of salt as it depends of your personal fitness level. The levels go from easy to difficult and very hard. To some people the long creek beds with many small rocks are very hard on their feet, to other people negotiating between big rocks or climbing boulders is very difficult and to some this is easy and fun. You may also be on an easy level trail with little elevation but you could be very exposed in the sun and this can be much harder than rock jumping. There are several important things you have to be aware of when you are exploring the park. Having good hiking boots with good angle support is a must. Even if you are experienced and careful you can twist your angle between the rocks if you are unlucky and there is one thing this park is not short of, it is rocks. Most trails are pretty rocky in one way or the other. Therefore it is recommended that you wear gators. It you don’t you will get some many small rocks into your boots which is a pain. You can get some cheap and good gators in Alice Springs. You have to stay hydrated. When you do a day hike of more than 12 km (7.5 miles) you should bring a least 3 litres of water. If you do more than 25 km (15.6 miles) you should bring at least 5 litres. There are very few places where you can refill so bring plenty when you start off the days hike. Furthermore apply plenty of sunblock and wear a shady hat. Bring plenty of snacks for several pit stops. If you are camping and doing your own and not on an organised tour you have to bring sufficient food, cooking gear, a tent or a swag and a sleeping bag and a first aid kit. Bear in mind that the park is located in an arid zone so it can get pretty cold after sunset. So bring extra layers of clothes such as a jumper and long underpants. If you set up a campfire, be careful and remember that the timber you use have to be collected outside the national park area. 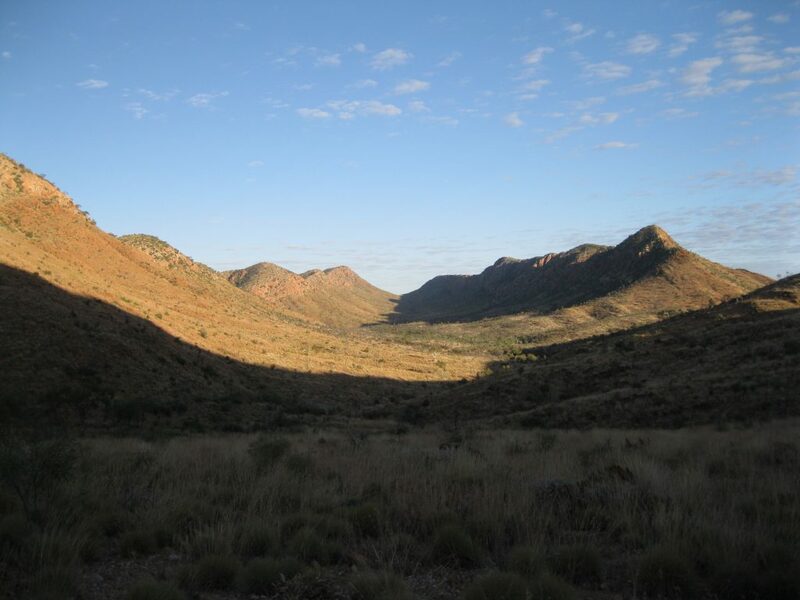 The Larapinta Trail starts at the Alice Springs Telegraph Station 15 minutes away from Alice Springs. At the beginning of every trail you will find a display of signs with an overview of the trail with information that is quite helpful. On the first part of section 1 you are on easy terrain which is good as it will ease you into the experience. You will see the old telegraph line which has thankfully been left as remembrance of the past of the reason why the city of Alice Springs was founded back in the day. Keep your eye out for wildlife. 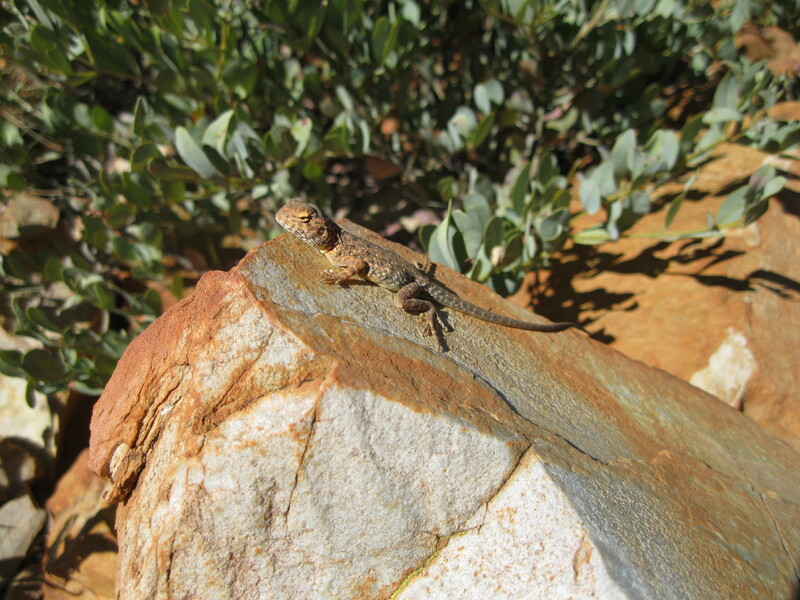 You may just spot a Bearded Dragon or other reptiles chilling out on the rocks. After 4.9 km (3 miles) you will get to the Geoff Moss Bridge which unfortunately crosses the trail but fortunately this will be the only major disruption to the trail and it’s not really a major issue anyway. This is actually a nice spot for a small pit stop. Later you will cross some train tracks that are used for the legendary Ghan Train going from all the way from Darwin to Adelaide. Continue onwards west of the railway tracks to Euro Ridge which is a significant point on this section as it will give you a great view of Alice Springs in the background and a feeling of the size of the mountain range. On the way you maybe be lucky to see some wallaroos (or euros as they are called in Central Australia) popping their head up for the buffel grass or jumping around. 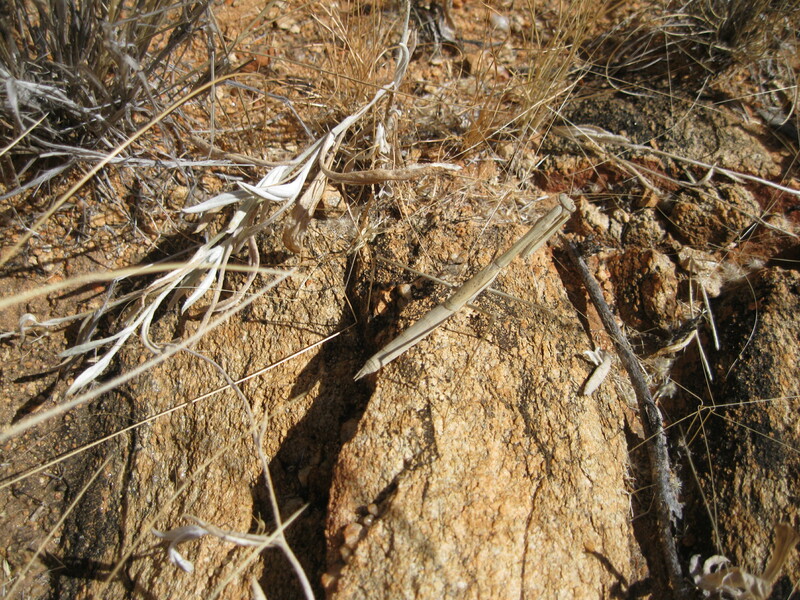 Be observant while walking as you may just spot a lizard, a dingo or even interesting plants such as the bush coconut. The bush coconut is an interesting combination of plant and animal. A female scale insect lives in a gall induced on a bloodwood eucalypt. The gall looks like a woody and knobbly fruit, ranging in size from a golf ball to a tennis ball. The inside consists of a white flesh in which the insect and its male offspring feed. It’s bush tucker food and to eat it you have to crack it open and eat the inner flesh. There are several of amazing gaps in the park and the first one on the trail is Wallaby Gap after 13.5 km (8.4 miles). This is a little bit off track so you have to do a little walk down to the gap to have a look. This is a really nice spot. It’s one of the smaller gaps on the trail but nonetheless still impressive with reeds, rocks and gum trees in the gap in between two great rock walls. On the first part of the trail you will be walking along the Chewings Range and you will be walking on top of it. In the distance there is a view of the Heavitree Range which you will get to later on the tour. Again, keep your eyes wide open as you may just see interesting birds, golden orb spiders or caterpillar nest on the way. 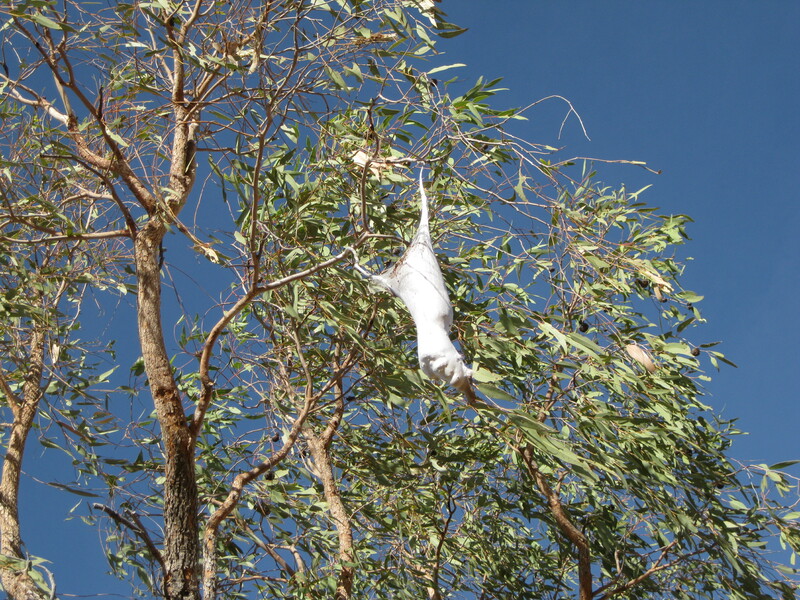 The caterpillar nests are massive sack-like and from a distance almost look like a small dead animal, hanging from acacia trees. If they are white, they are still active. If they are brown, they are dead. After 17.8 km (11.1 miles) on section 1 you will get to Scorpion Pool which is another awesome little spot in the shade with a pool as a small rocky gap. This is a nice place to take some photos, also looking back to where you came from with the Heavitree Range in the background. Continue onwards and you will get onto a bit of elevation up to Hat Hill Saddle where you will be approached by the amazing Rungutjirba Ridge which is a stunning rock wall that will continue on the way down the saddle towards the final stop and highlight on section one which is Simpsons Gap. The further you continue on the better the view will be of the ridge and the closer you get to Simpsons Gap the more impressive the view. After 23.8 km (14.9 miles) you will arrive at Simpsons Gap. This is one of the major sights on the Larapinta Trail. It is quite impressive and you should walk down through the gap and have a closer look. At the end of the gap there will be a small pool. Do not attempt to climb the rock walls due to the presence of wildlife. You may be lucky and spot Black-footed Rock Wallabies on the rocky slopes. For the most effective way to spot wildlife, stand or sit quietly and watch the slopes. All of a sudden you may spot a wallaby. Sadly the Black-footed Rock Wallaby has become an endangered species due to introduced habitat such as rabbits, cattle and horses, but fortunately the park plays a vital role in protecting the wallaby. The Black-footed Rock Wallaby is found in central Australia in colonies on rocky outcrops with caves and crevices with suitable food. They have roughly textured foot pads that gives them a good grip when meandering through the rugged terrain with their agility. The tail is used for balancing when jumping. The Black-footed Rock Wallaby is one of Australia’s unique marsupials. When the environmental conditions are right, the female can have a joey close by, another one in her pouch and a third in her uterus. Now that is full-time work. If you arrive at Simpson Gap around midday you will find a perfect lunch stop at a massive tree in the middle of the creek bed just outside the gap. 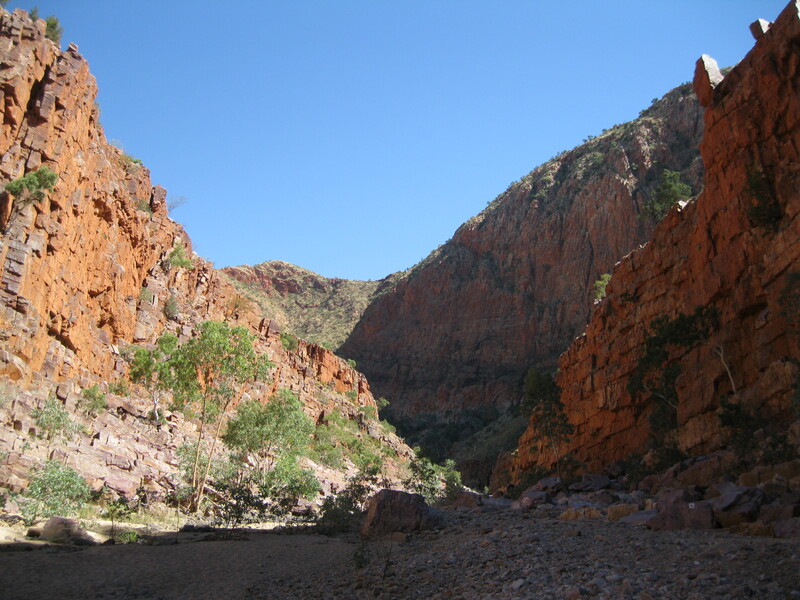 The formation of Simpsons Gap is similar to many of the other gaps and gorges in the park. 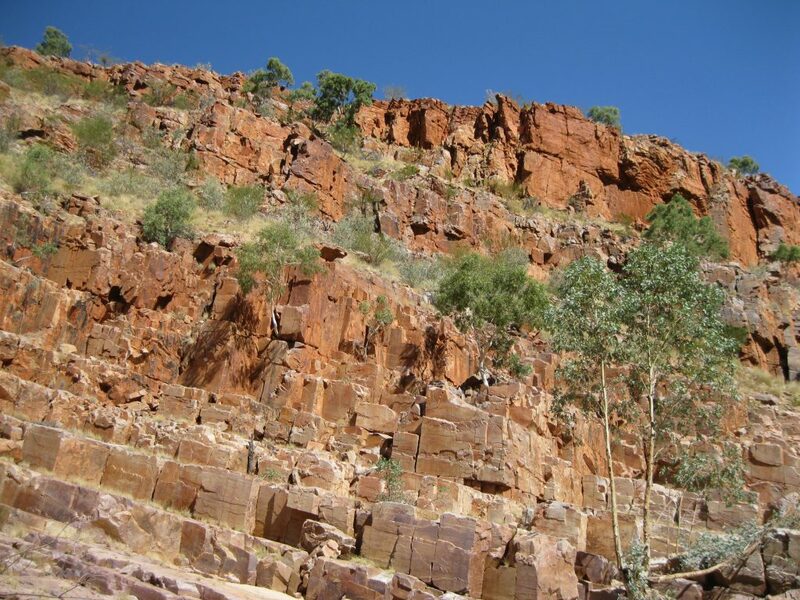 It happened millions of years ago after a break or a weakness in the Heavitree Quartzite that the MacDonnell Ranges is formed of. As the land rose, powerful food waters would cut into the rock and carve out the gap we see today. 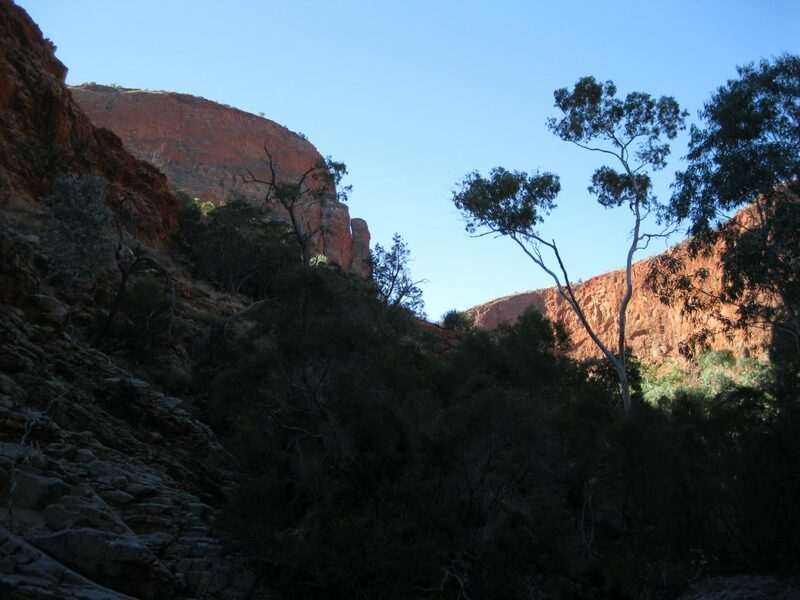 Section 2 of the trail stretches from Simpsons Gap to Jay Creek and is a big hike of 24.8 km (15.5 miles). It is therefore recommended that you leave from Simpsons Gap early in the morning so you will arrive at Jay Creek before sunset. As you make your way on the trail you will have a great view of Simpsons Gap so make sure you check it out along the way and look back to the gap. The view of the gap will be different to the one you had at the end of Section 1. The trail is not too strenuous as you will be on fairly level ground with great views of the Chewings Range as you stroll along. After 8 km (5 miles) you will get to Bond Gap which is quite an impressive gap formation. As you walk closer you will enter a quiet world of vegetation of gum trees and reeds in between massive red rock walls walking on sandy and rocky grounds. Such an awesome spot. Meander your way through the vegetation and rocks and take your time to take it all in. As you continue on from Bond Gap you will continue along a ridge that will lead you up to a double peak called Arenge Bluff which is pronounced “Arunga Bluff” in the local Arrernte language, and Arrernte is pronounced “Aranda”. This peak will be in your view for quite a while and you will get to see it from many different cool angles. The further you continue down the trail the better the view will be until it becomes more distant. You get to a creek bed which you cross and a bit further down the track you reach Arenge View with a great view of Arenge Bluff and also a great spot for a little break and a snack. The area between the creek and the next major stop, Mulga Camp, has been hit by a fire so is a bit barren, but it will blossom which a couple of years again. Mulga Camp is a great area for a lunch stop on this big day. If you are a single traveller you can fill up our water supply here as there are water tanks. As a traveller with an organised group you shouldn’t really do so as it’s meant for independent hikers. But if you are very low on water you will be allowed to anyway. Have a good rest here on this long day. Take off your boots, socks and stretch your feet. There are picnic tables where you can sit down and have lunch. 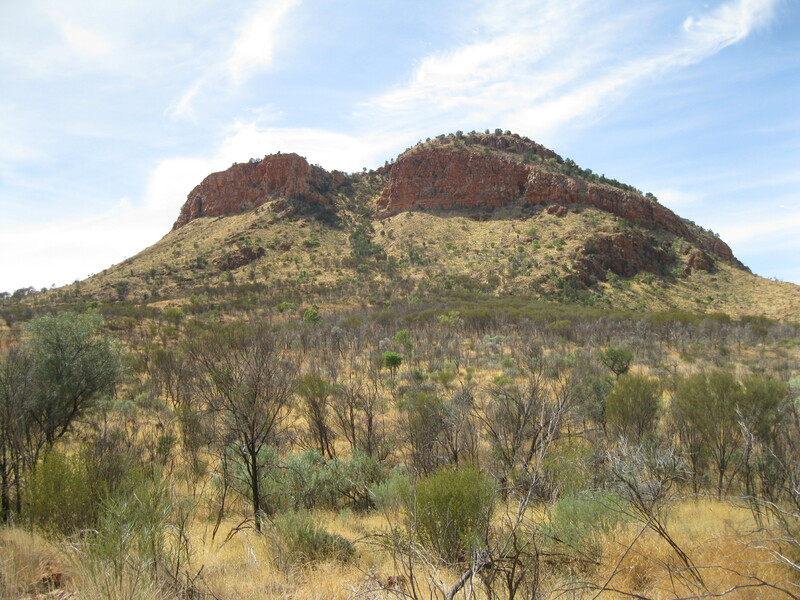 As you head on after Mulga Camp you will have the magnificent Mt Lloyd to your left. This awesome mountain will be in your view all the way down to the end of the track at Jay Creek. There will be plenty of opportunities to take great shots along the way. Check out the amazing vegetation of bushes and gum trees. 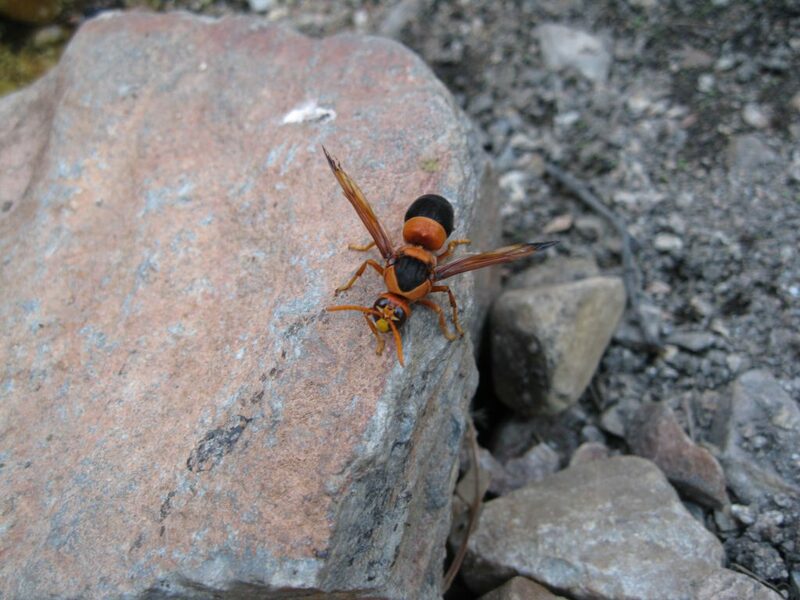 You may even spot some insects as well such as grasshoppers or golden orb spiders. At the end you will arrive at Jay Creek which you will have to cross. Bear in mind if you are visiting during winter all these big creeks will be mostly dried out. There are camping facilities including a drop toilet right at the creek but you can also chose to stay on the grounds of the Old Hamilton Downs Homestead with is just one km (0.6 miles) from Jay Creek. It’s just down a 4WD track and as soon as you get to a gate you will exit the park and enter the property. This is a nice spot but you won’t have toilet facilities. If you want to stay here it has to be pre-booked. On Section 3 you will experience fair bit of elevation and there will be a bit of rock climbing as well ahead of you which is really cool. The total hike is 13.6 km (8.5 miles). 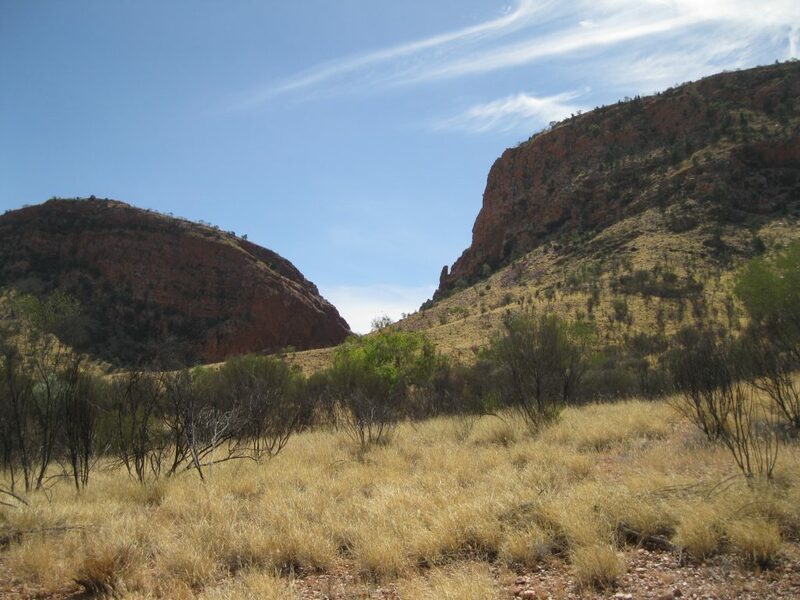 The first point of interest is Fish Hole and to get there you will be walking all the way through the creek bed of Jay Creek until you get to a waterhole after 1.8 km (1.1 miles). This is a nice little spot for taking some great shots. Take a close look at the rocks. You may be able to find some interesting colour patterns. Some even look a bit like Aboriginal rock art, even though it’s not. There are some really beautiful red and pink tones in the rocks here. You will then be passing through the waterhole which should be possible without getting wet. After Fish Hole you continue on a historic track was carved out on the western side of the pool. The path was established in the early 1900s for camel trains so they could get through the ranges between Hermannsburg and Hamilton Downs homestead. Camels don’t like rocks and steep slopes especially when carrying heavy loads. Once you are off the camel path, the track heads into the valley of the Chewings range with a beautiful landscape of bushes, gum trees and also note the small termite mounds which are much small in Central Australia as opposed to the Top End where they are much taller as they have to be resistant to massive floods. You will make a climb up to a summit which in itself is not too strenuous but it can be a tad hard as you will be very exposed in the sun. As you continue onwards you are faced with views of rock walls, mountain ridges and lush vegetation. Absolutely awesome. When you get to Millers Flat you continue along the Chewings Range through a landscape of more stunning vistas towards a chasm where you will be doing some cool rock climbing. This is great fun but be careful. Once you get beyond this chasm and ascent you are met by breathtaking views of the valley, the Chewings Range and Standley Chasm which you will be hiking towards. Amazing views at this point on the trail which continues towards Standley Chasm which is a big hike downhill. When you get to Angkale Junction you are at Standley Chasm. Mind you this area is big and has several entrances. You will be continuing down through the chasm towards the carpark area where you will be doing a lot of climbing here which can be a bit tough after a hard day in the scorching sun. Again, you will have some fantastic views along the way and a view of the Heavitree Range in the background as well. 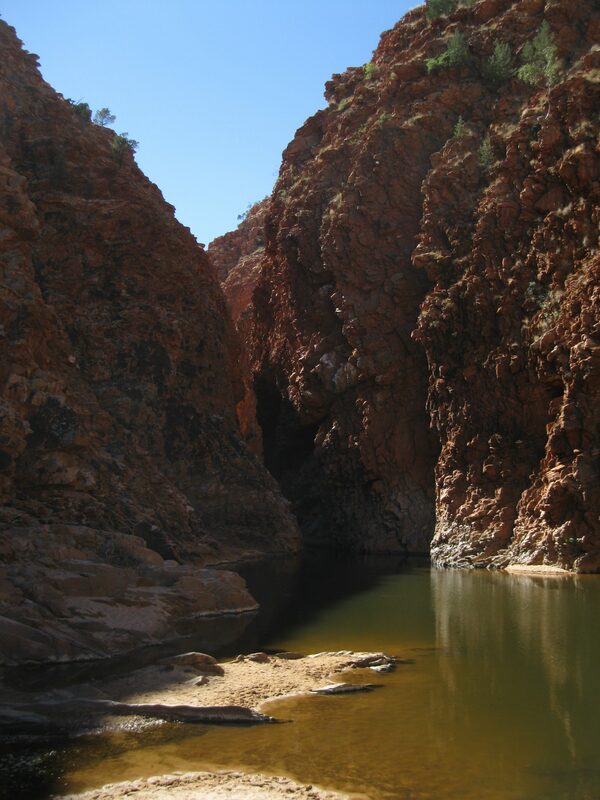 When you get to the carpark area take a stroll down to the left where you will find the most famous part of Standley Chasm which most tourist visit as it is not a long walk from the carpark. This is a very narrow and tall chasm which is quite impressive. The quartzite walls of the chasm were formed by ancient seabeds around 2.2 billion years ago and are some of the oldest mineral formations on Earth. The quartzite resembling marble are actually blue grey but oxidation has given them a red surface. The north south orientation of the chasm only allows for sunlight for about 90 minutes at midday. The illumination gives the wall a stunning glow. If you look at the floor you will notice a variety of rocks and minerals. These hare been deposited by by water over time, constantly evolving the riverbed. Section 4 of the trail was 16.6 km (10.4 miles) long but has been realigned to 17.9 km (11.2 miles). It is a tad strenuous with a fair bit of elevation but also a very scenic day. The first part of the hike will be along a creek bed which can be a bit strenuous mostly due to the strain on the feet. You will be surrounded by the wonderful scenery of the Chewings Range which is awesome. After a couple of kilometres the elevation will start to pick as you will make your way up to Bridle Path Lookout and further on to Reveal Saddle where your hard work will be rewarded with amazing vistas of several peaks of the Chewings Range and the Heavitree Range in the distance. Take your time to have a look around. You can take some killer shots up here of the different peak from many different angles. You could take a picture of the edge of the peak you’re standing on with one of the other peaks in the background. The possibilities are endless. This is also a good spot to have a water and snack break. It’s a really awesome spot and one of the highlights on the trail. As you continue you will encounter more elevation as you make your way to the Brinkley Bluff Summit. On the way you will have amazing views of various peaks of the Chewings Range anywhere you look. Remember to look back to where you came from as well. 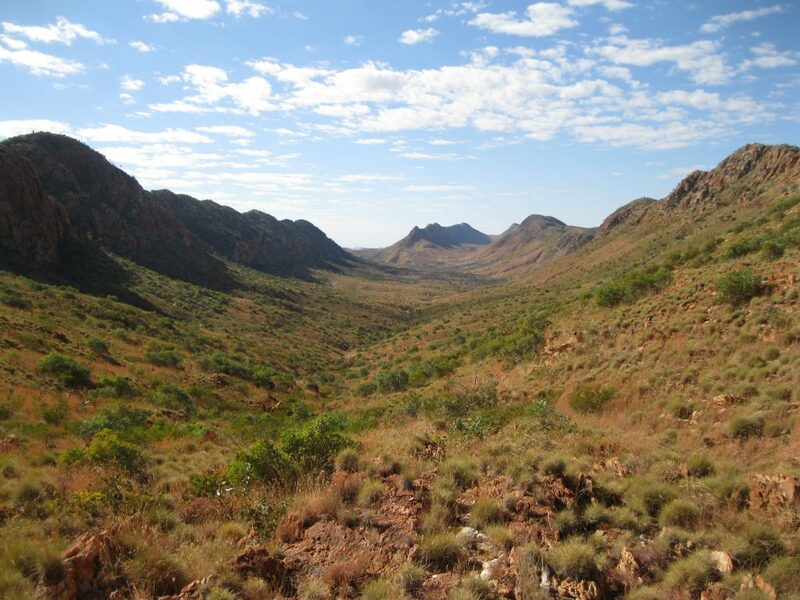 This stretch will give you some of the most spectacular scenery on the whole Larapinta Trail. Really amazing stuff and one of the highlights. It’s a bit of a walk and a climb especially at the end, so take your time and enjoy the view and take a couple of shots. When you arrive at the summit you should have a pit stop and take your time to take it all in. This is also a very good spot to have lunch. The view at the Brinkey Bluff Summit is absolutely breathtaking as you will be at 1209 metres (3967 ft) on top of the Crewings Range with views of the range and the surrounding landscape and peaks as far as the eye can see. After you have explored the summit you have head off. Sometimes walking down a rocky trail is harder than climbing it. You will have fantastic views yet again as you make your way to the next major point of interest. This is a small gap in a rock wall called Rocky Cleft which is a dried out waterfall most of the year. To check it out up close you have to climb down a bit off the trail. But be careful when you get to the edge as there is a deep vertical drop at the end. The fern-looking plant which is found at Rocky Cleft and in many other areas of the park is a MacDonnell Ranges Cycad. 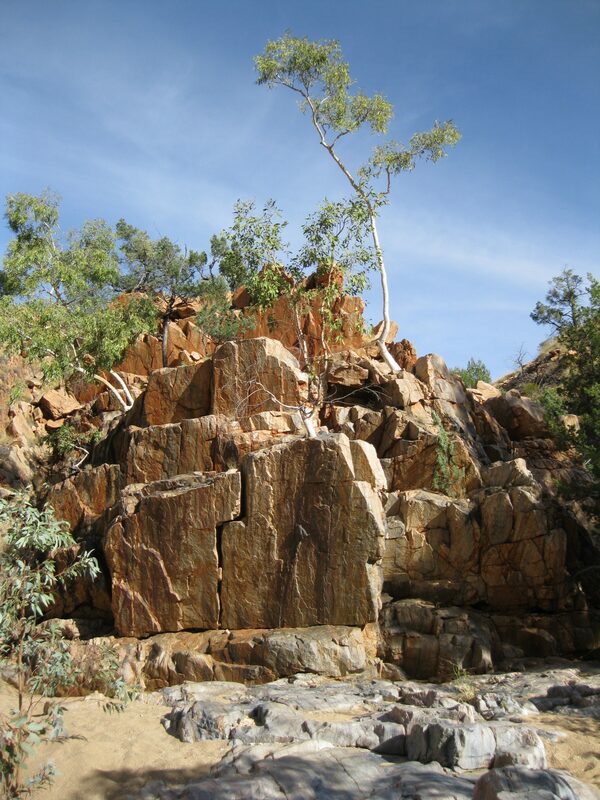 It is only found in the southern part of Northern Territory and pretty much only in the MacDonnell Ranges. You will mainly see it in protected gorges, gullies, river edges and on south-facing ridge slopes. The leaves grow from 1.5 metres (4.9 ft) to 2.5 metres (8.2 ft). The crown has 50-120 (1.6-3.9 ft) keeled leaves. The trunk grows to 3 metres (9.8 ft) tall, 60-80 cm (2.0-2.6 ft) in diameter. An interesting feature is that it has male and female cones. As you continue onwards and you will have to do another little climb over a ridge and you will be walking down into a valley towards Stuart’s Pass. You will have great views all the way down, not only of the valley of rounded hills but also when looking back at the ridge which you came from where the view is of rugged red peaks. A great contrast in the landscape. This is also one of the best stretches of the Larapinta Trail. When you get to Stuart’s Pass you will be at Hugh River, another great point for a rest after a big day. Cross the river, which is dried out during summer, and head on down towards the end of the trail. This last stretch is on pretty level ground and not strenuous but is seems longer than what the official kilometres suggest so it can be a bit hard at the end of the day when you looking forward to reach the end. It’s says that the hike is 3.6 km (2.2 miles) but it honestly feels more like 5-6 km (3.1-3.8 miles). On the way you will pass Mintbush Spring which is neat to check out, then continue all the way down to the end of the trail where there are camping facilities. But the coolest place to camp is 0.9 km (0.56 miles) beyond the trail down to Birthday Waterhole. This is a great little isolated spot where you can set up camp, but your swag out on the creek bed and then go for a dip in the waterhole if you are up for it. Mind you it will be cold but so refreshing after a long day of hiking. Absolutely awesome. Section 5 is an amazing hike but also a strenuous one at times as it will be rocky and have a fair bit of elevation. 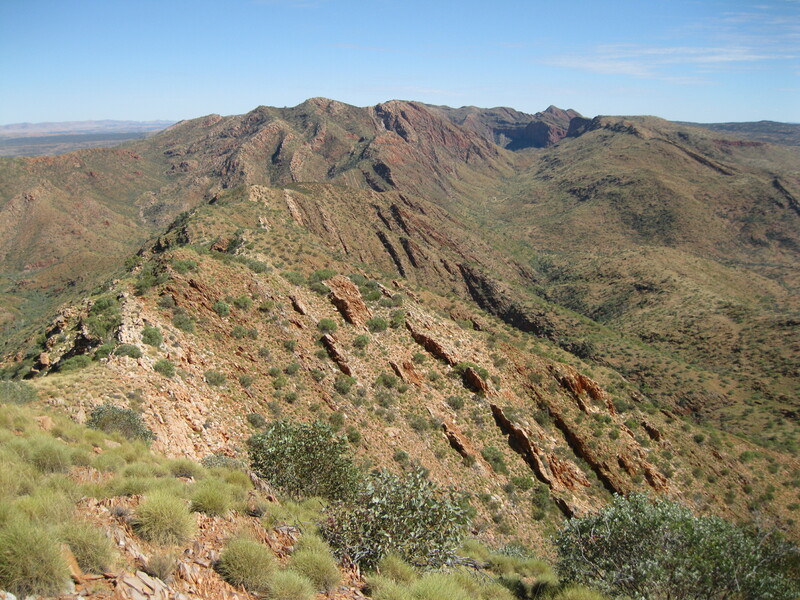 This section has some of the most stunning scenery on the whole Larapinta Trail and stretches over 14.9 km (9.3 miles). 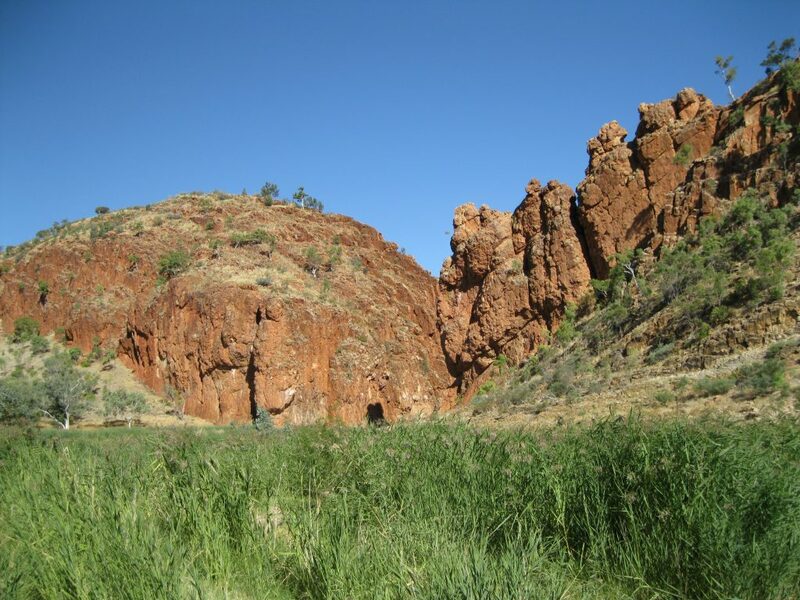 As you make your way from Birthday Waterhole up to the trail you will be walking through a creek bed and down a track to where the Larapinta Trail picks up again. It will be a pretty level walk through beautiful scenery of rocky slopes and rugged peaks down to Spencer Gorge after 2.1 km (1.3 miles). 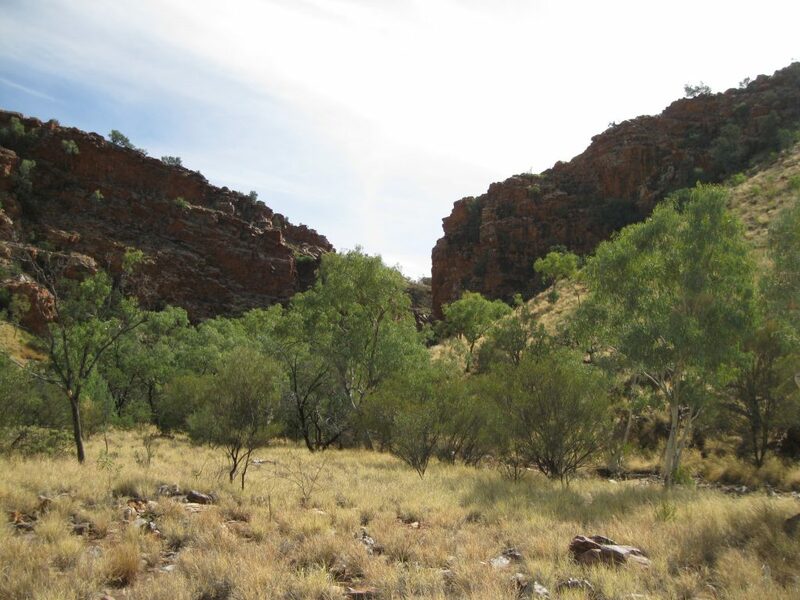 The terrain changes at Spencer Gorge to a very rocky creek bed with an abundance of vegetation of bushes and gum tree beautifully secluded in a narrow gorge of red rock walls. The hike becomes more of a challenge here mainly due to all the small rocks in the creek bed that are pretty hard on your feet. There will also be sections of boulders which to some are easier to navigate through as you can do a bit of rock hoping. Be careful and only do this is you are experienced and feel comfortable doing it. You will most likely be concentrating on working yourself through the gorge, so don’t forget to stop up and have a look at this lovely area. As you get to the end of Spencer Gorge the elevation will start picking up and you will get to Rocky Talus after 1.4 km (0.88 miles). As you climb Rocky Talus you will be exposed to some phenomenal views of the Chewings Range. When you get towards Windy Saddle you can also get a perfect view of the narrow ridge you will be continuing along. Such stellar scenery and a great spot to have a breather and taking for shots. Here you will also have a perfect view of Paisley Bluff. You will be making your way downhill as well towards Razorback Ridge and as you walk along you will get to an area where it does get a bit narrow so you have to be a tad careful. At Razorback Ridge you should have a break and take in the view. Also here you will have a perfect view of the narrow ridge you will be continuing on. 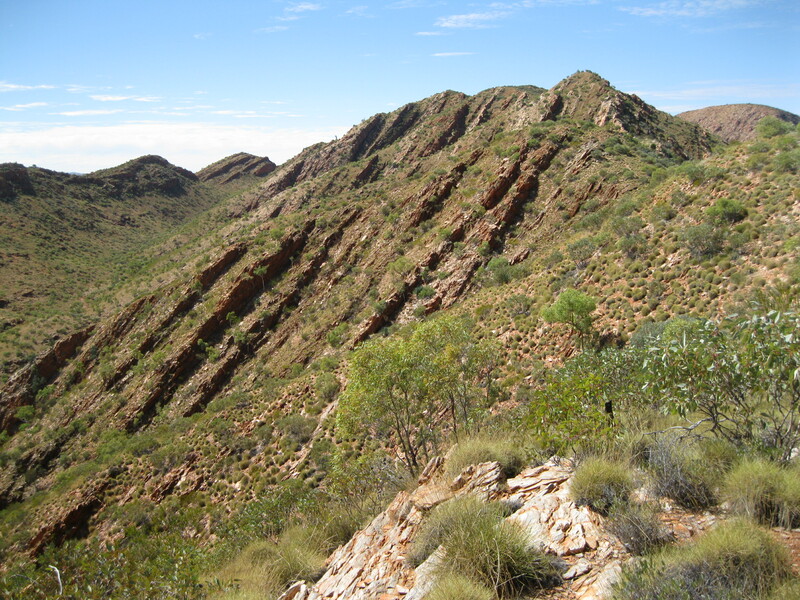 The stretch all along this ridge is one of the most breathtaking on the Larapinta Trail. As you head on down the ridge, the mountain peak straight ahead of you opposed to the ridge is a tad reminiscent of some of mountains you see in Hawaii with ridge lines going vertically down the mountain. The colours of the mountain just differs. As you get towards the end of the ridge you will be heading down and it can be a bit steep at times so be careful. Even though it is tempting to rush down the hill, don’t forget to have a breather, take some shots and enjoy the scenery on the descent. Notice that you will be getting to the first part of the trail where you will see spinifex grass as well. Once you get to the bottom you will be at Fringe Lily Creek where you will have a bit of shade which is a perfect spot for a lunch stop. The trail continues towards Rocky Saddle. Again, beautiful scenery along the way and remember to look back to where you came from where you will see the ridge you descended from and the surrounding peaks. As you climb up to Rocky Saddle the views which become more apparent and more stunning with a great vista of Linear Valley which you are walking along. As you get to the top of Rocky Saddle the landscape of both sides of the valley comes into view and scenery ahead of you will blow your mind with massive peaks and rock walls. The landscape of both sides of where you came from and what you are heading into is just magnificent. 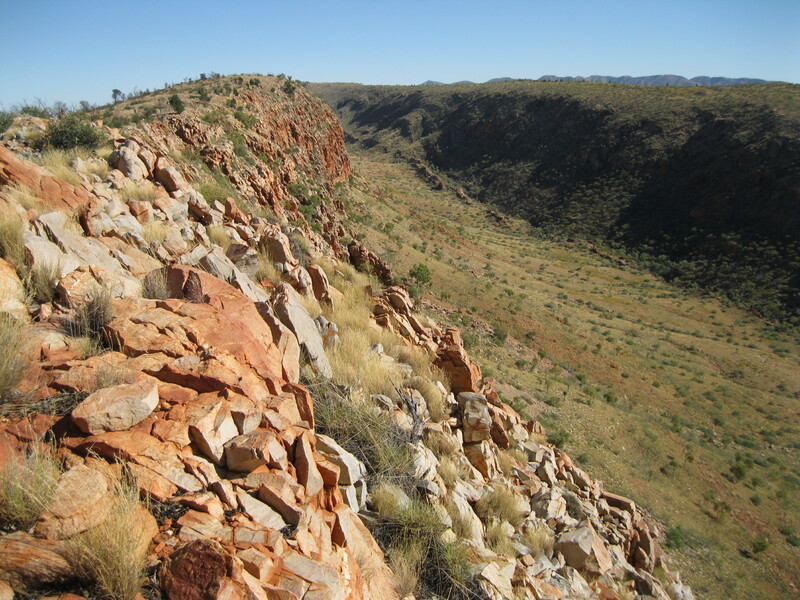 This part of the trail is also one of the most beautiful on the whole Larapinta Trail. It is not too strenuous in itself making the climb up to Rocky Saddle but can be a bit tough due to the exposure in the sun. Also as you will most likely be doing this part of the hike after lunch where the sun is really hitting you hard. So always remember to keep yourself hydrated. When you’re on top of Rocky Saddle you should take time to take it all in, have a breather, drink some water, have a snack and a rest. As you head down the hill you will be approaching the massive rock walls which you have seen from the top of Rocky Saddle. Absolutely amazing views and take your time to enjoy it. These peaks are nameless which makes you wonder a bit as it will be some of the most beautiful peaks you have ever seen. As you get to the bottom you will arrive at Huge Gorge Junction. Yet another great spot for a chill in the shade and a snack. The views of the mountain peak you saw from a distance at Rocky Saddle are now up close and you can get some awesome shots. 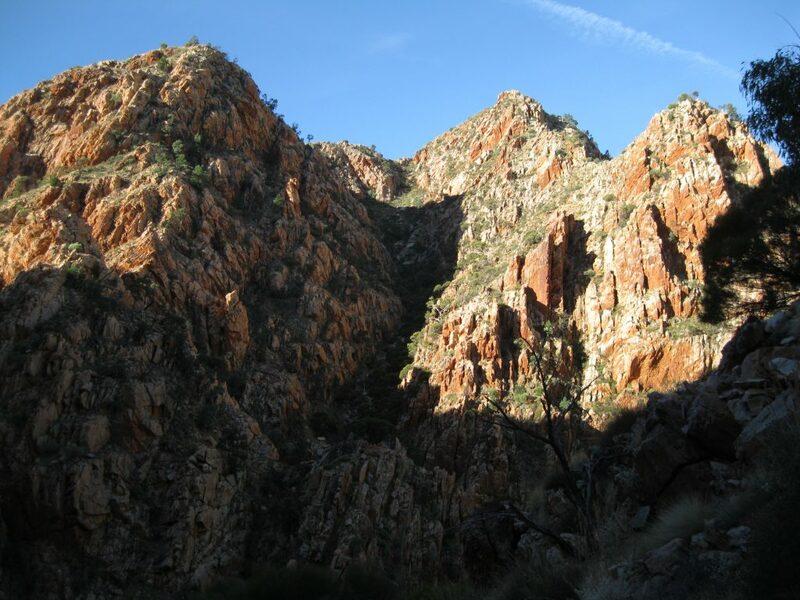 You will be continuing into Huge Gorge and this hike through a gorge of massive steep sided rock walls in the Chewings Range is yet another one of the most stellar parts of the Larapinta Trail. You will be more in the shade if you are here in the afternoon but it does get a bit strenuous as you will be tired and you are walking all the way on a rocky creek bed which will be a strain on your feet no matter how good your hiking boots are. Still it such an amazing hike. Remember not only to look ahead into the fantastic Hugh Gorge but also back to where you came from. 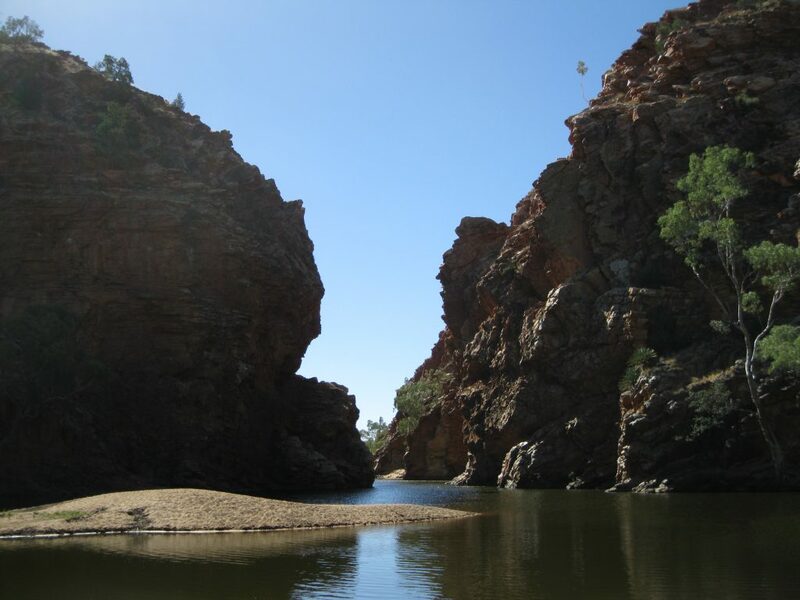 In the beginning of the gorge you will get to a waterhole which you will cross. This should be possible without getting wet. Once you get to the other side of the waterhole you can get some amazing shots of the rock walls of the entrance to the gorge reflected in the water. As you continue onwards through the rocky trail the gorge opens up and the scenery will amaze you and it continues to change as the walk goes on. Taking photos becomes more and more of a challenge as there will be less sunlight in the gorge. In both directions you will see majestic red peaks. The hike goes all the way down to Pocket Valley which you will pass by and then all the way down to Hugh Gorge Camp with camping facilities based on the Hugh River. Yet another great place in isolated surroundings just like Birthday Waterhole. You will be a bit secluded at the riverbed next to a rock wall in the shade. Awesome peaceful place to pull out your swag and perfect for a campfire, some grub and we well deserved sleep afterwards. Section 6 is mostly on level terrain until the final 3.7 km (2.3 miles). It’s a long stretch of 30.3 km (18.9 miles) but the hike in itself is not too strenuous, it’s more the vast exposure in the sun that makes it hard. So it would be recommended to start as early as possible. Still no matter how early you start you will be walking when the sun really hits you hard in any case. You could decide to divide the day into two as Section 5 is a tad challenging and you may want to take it easy. You could camp at Rocky Gully which is approximately half way. It’s yet another interesting day, not so much because of the scenery for the majority of the walk but because this is the part of the trail where you will be heading away from the Chewings Range across the Alice Valley to the Heavitree Range. 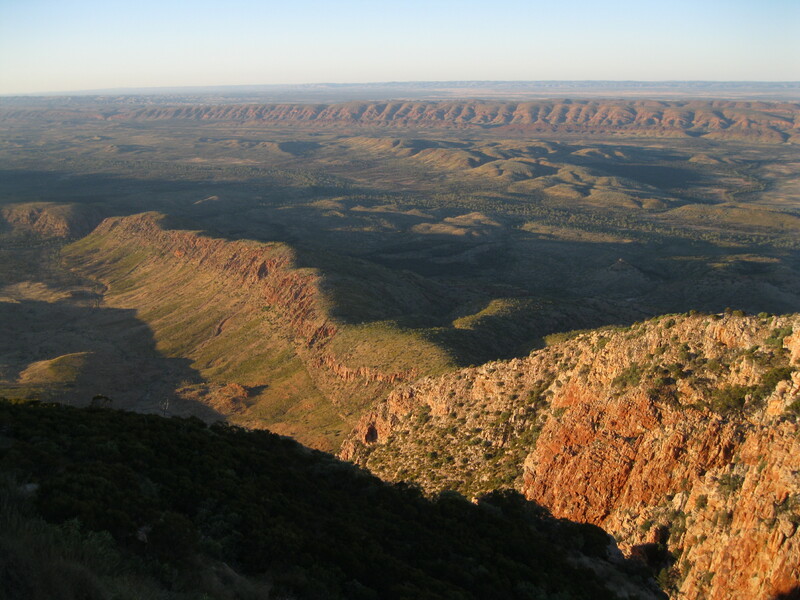 The day starts at Hugh Gorge where the trail leads through the Alice Valley on an easy level path towards the first major stop called Hugh View after 3.8 km (2.4 miles) with a nice vantage point of the Chewings Range. Head on towards the next point of interest which is Ghost Gum Flat after 6.9 km (4.3 miles). As you are on easy level terrain you will be down at Ghost Gum Flat very fast and because of this you will be covering large distances much faster than on the other more challenging days. If you have decided to camp at Rocky Gully you could have lunch here. 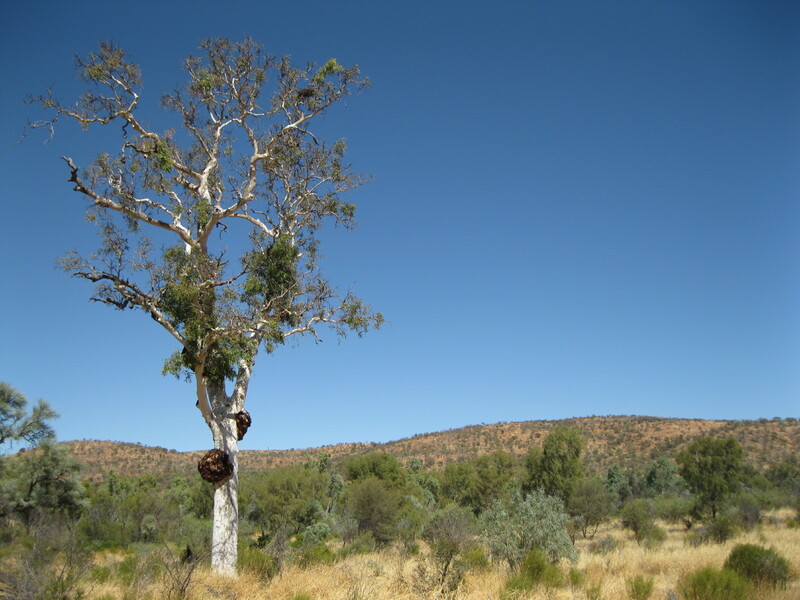 At Ghost Gum Flat there is a magnificent ghost gum tree which is very picture worthy. Just be aware of spider webs as you approach the tree. You may be lucky to see some golden orb spiders here. Note the big lumps on the tree. These are tumours which are a defence mechanism by the tree when it’s being attacked by invasive insects. As you head on after Ghost Gum Flat the elevation picks up and around midday the heat will begin to kick in and you will be very expose to the sun in this terrain. It will be hot on most days so remember sunblock, a good hat and drink plenty of water. On your way it’s a great idea to take time to check out the native plants. You will see the Lantrobe’s Desert Fuchsia (Eremophila Latrobei) among others which is a really beautiful plant. When you get to Rocky Gully it will begin to go downhill again and the Heavitree Range will come more into view. The stretch from Ghost Gum Flat to Rocky Gully is 8.4 km (5.25 miles) where you will be exposed in the sun. In a way harder than the more challenging days with creek beds and rock climbing as you will be in the shade some of the time on those days. Again, you can choose to camp at Rocky Gully or continue onwards. As you head on from Rocky Gully on the trail you will be getting closer to the Heavitree Range and the Chewings will be further away in the distance as you pass through level terrain and dried out creeks. Keep an eye out for insects and other wildlife. You may just spot a praying mantis. The closer you get to the Heavitree Range the better the view, you will be able to get some great shot of the massive rock wall you will be climbing and the gap known as the Saddle which you will be passing through to get on to the ridge of the Heavitree Range. Impressive stuff. Climbing the Saddle can be a tad strenuous but not too hard. When you are on top of the Saddle you can get some great shots of the ridge. As soon as you get beyond the Saddle you will notice that the scenery changes. There will be rocks looking like conglomerate but they aren’t. These are tillite rocks. Really interesting scenery and a great contrast to what you’ve seen so far. In distance the Pacoota Range will become visible for the first time, a beautiful range of rounded hills. You will be heading of the ridge of the Heavitree Range, have it to your right and the Pacoota Range to your left as you will be walking through a nice vegetated area on a pretty level trail. Note the massive spinifex plants which are the bull spinifex. Towards the end you will be heading downhill and with a view to you right of a gap and Ellery Creek in the distance. Ellery Creek is a very nice culmination to a long day exposed in the sun. So bring out the bathers and take a dip in the creek. It will be pretty cold but very refreshing. The Ellery Creek Big Hole, as it’s called, is one of the largest permanent waterholes in the park and is very important for the local wildlife. The water is deep but for your own safety do not jump off any of the rocks. 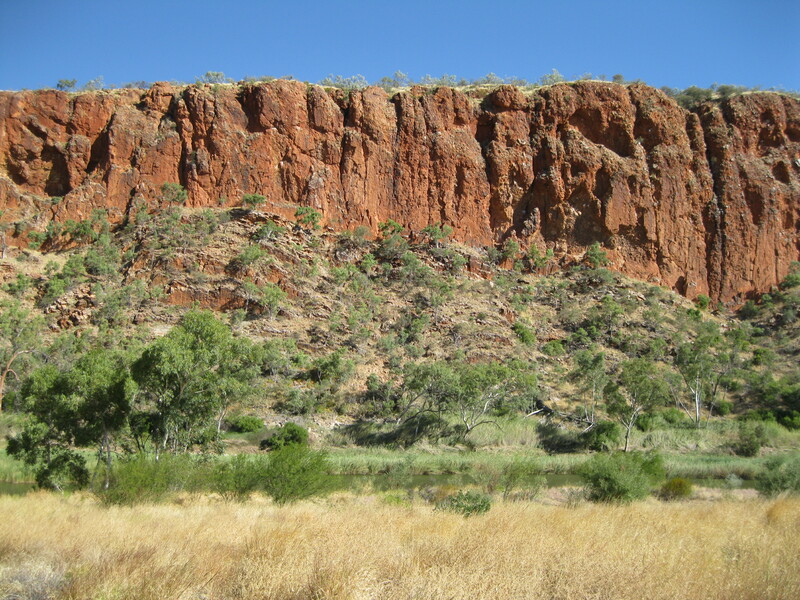 Ellery Creek is also of great interest to geologists. An almost complete sequence of sedimentary rocks can be seen along the banks laid down over a 400 million period. The exposure extends down 8 km (5 miles) downstream, south from Ellery Gap. About 600 million to 850 million years ago sediments were deposited on top of each other creating a so called “rocky sandwich” nearly 2 km (1.25 miles) thick. The dominant lifeform at the time were algae which is why so few fossils have been found in the rocks today. The rock strata exposed are now tilted in a near vertical direction and run at right angles to the creek banks. About 800 million to 850 million years ago a flat desert was covered by a shallow sea. A thick layer of sand was deposited. The sand began to harden under massive pressure to form the Heavitree Quartzite which was very resistant to erosion. This can be seen in the present landscape. It is the high ridge on either side of Ellery Creek Big Hole. The Sea became shallower about 760 million to 800 million years ago and formed a series of tidal lagoons in which layers of lime-rich mud and silt were deposited. The lime-rich mud hardened to form dolomite and the silt became siltstone. Both soft rock that easily crumble by earth movements. It can be seen in the low spinifex covered hills of the main ridge. The greyish rock forming the higher outcrops is dolomite. About 620 million to 760 million years ago glaciers melted from two ice ages which caused erosion and deposited some of this eroded material to form new rocks of pebbles, boulders and rock powder. These rocks are easily eroded and can be seen in the low rises and creek flats south of the greyish dolomite ridges. Around 600 million to 620 million years ago the sea returned but was deeper and the lifeforms that appeared were more complex such as jellyfish. Fine-grained sediments were deposited on the floor. 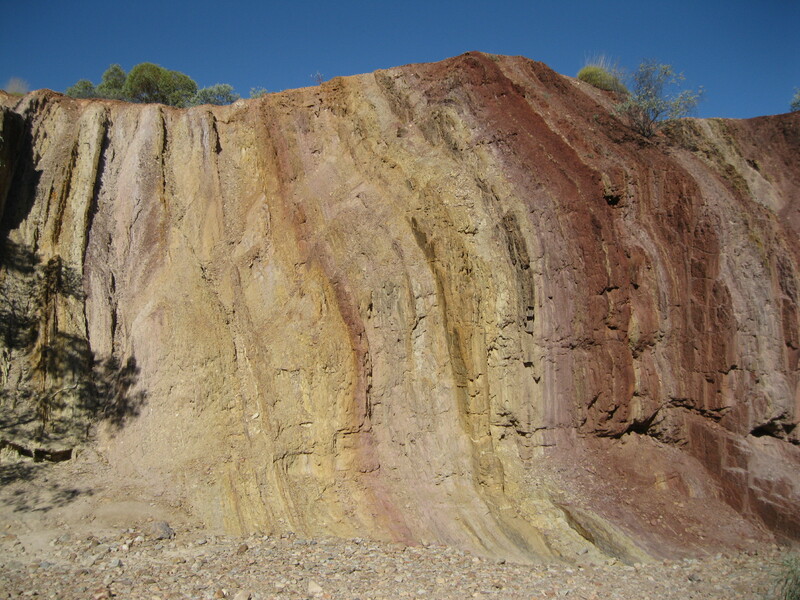 Red-brown easily eroded shales were formed which are the low rises bordering the northern side of Namatjira Drive. Between 310 and 340 million years ago a complex series of events shaped the land we see today. The Earth’s movements pushed up mountain chain 10,000 metres (32,808 ft) high. 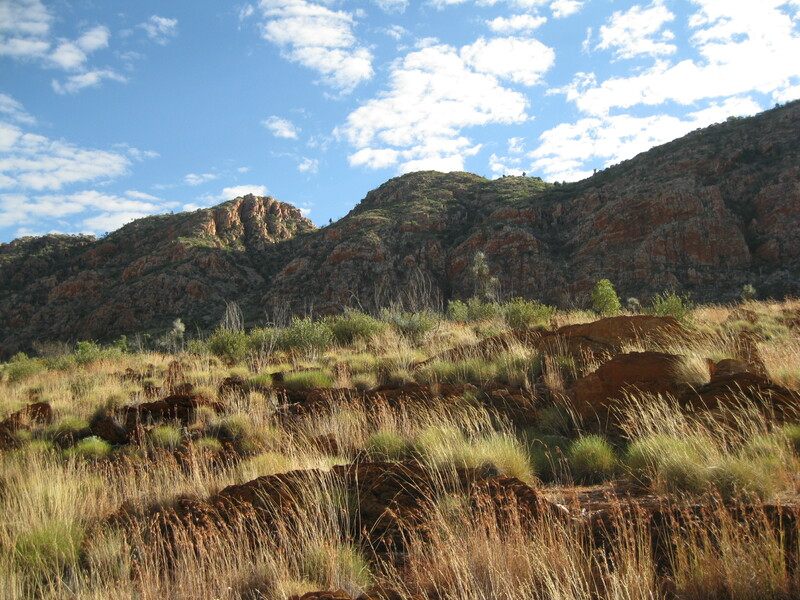 The MacDonnell Ranges at the time were as high as the present day Himalayas. As you look at the landscape you will find evidence of this mountain building episode. Massive earth movements made great chunks of land to slide upon one another. Faults, cracks and other weaknesses were formed as layers shifted. During the last 300 million years incredible forces of wind and water shaped the rock layers to the landscape we see today. As you drive from Ellery Creek Big Hole down to Namatjira Drive you will be travelling through 250 million years of history. On Section 7 you have yet another awesome day to look forward to of 13.1 km (8.2 miles) and about an additional kilometre if you do the Dolomite Walk. There will be a little bit of elevation on this section but it is not too bad. The walk starts from Ellery Creek and you can start off by going on the Dolomite Walk which is an alternative route of 3 km (1.9 miles) onto the Larapinta Trail. You will be hiking along the Heavitree Range which will be to the right all through the day. 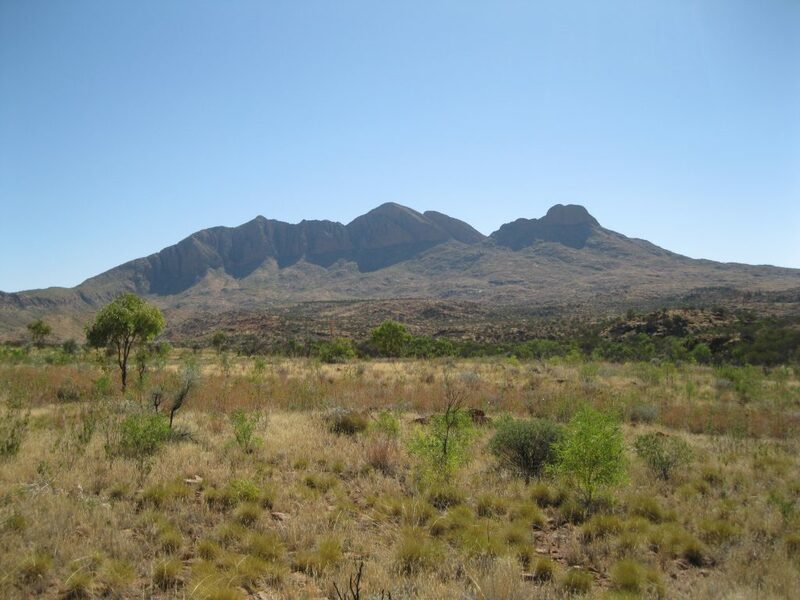 You will note the presence on spinifex plants and some cool rugged peaks on the hills. After 2 km (1.25 miles) on the Larapinta Trail itself you will get to a fence and a wooden bench-looking footpath which you can cross. This just marks a short section of the trail that goes through Roulpmaulpma Aboriginal land. Along the way as you are walking on a small ridge, you will have the beautiful view of the Heavitree Range to you right and the Pacoota Range to your left. You can get some cool photos of the ridge on which you a walking. You may be lucky to spot the state flower of Northern Territory, the Desert Rose which technically is a hibiscus and not rose. After 9.2 km (5.75 miles) on the Larapinta Trail of the hike you will get to a spot known as Trig Point. This is a pole that is a survey marker to measure distances to different places from here. This is also a great place to have a breather and a snack. Further on along the ridge you will get some great views again of several rugged peak which are some pretty cool rock formations. Your make you way a bit off the ridge and pass a creek. 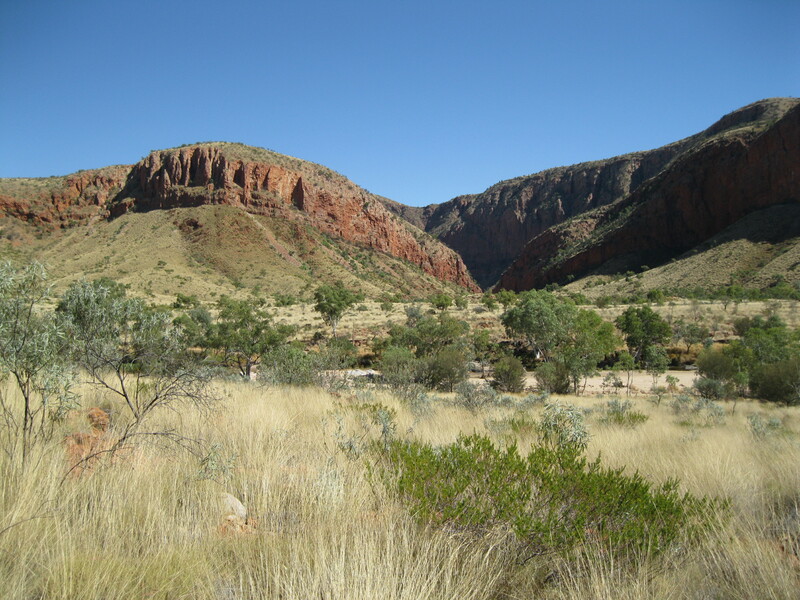 From here you will have 3.1 km (1.9 miles) to the Serpentine Gorge Campsite along the beautiful scenery of the Heavitree Range. At the campsite you can have a breather, and use the drop toilet. There is also water available for individual Larapinta hikers only as a general rule. 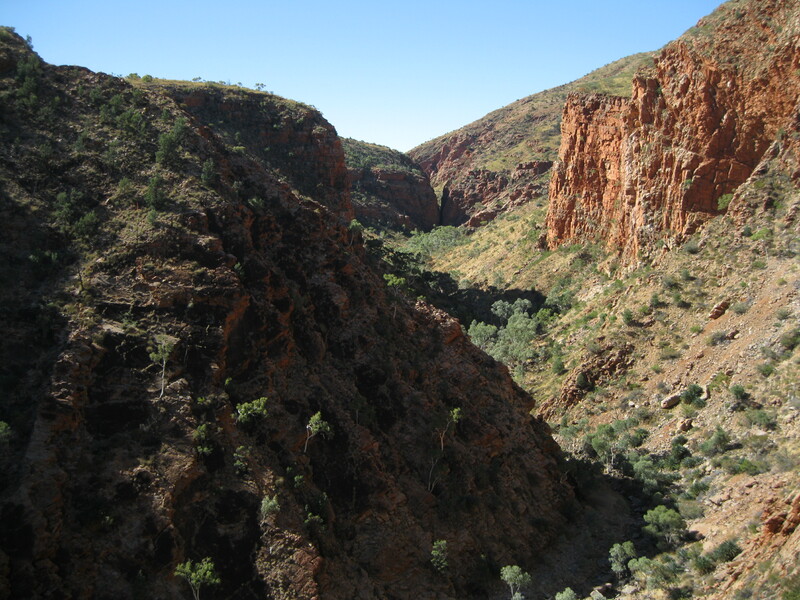 Make your way down to Serpentine Gorge which is definitely the highlight of the day. Meander up to the vantage point area. This is a bit of a strenuous climb but it is worth it and not too far. The view of Serpentine Gorge is absolutely stunning. You can get some magnificent shot of the gorge from all sorts of angles and some good ones with yourself posing in front of it. There is a fenced vantage point which is good but you can also climb up on the rocks and get a very good shot. Just be careful. This is actually also the best place to get your own photo taken. The view of the Pacoota Range in the other direction is pretty good as well. 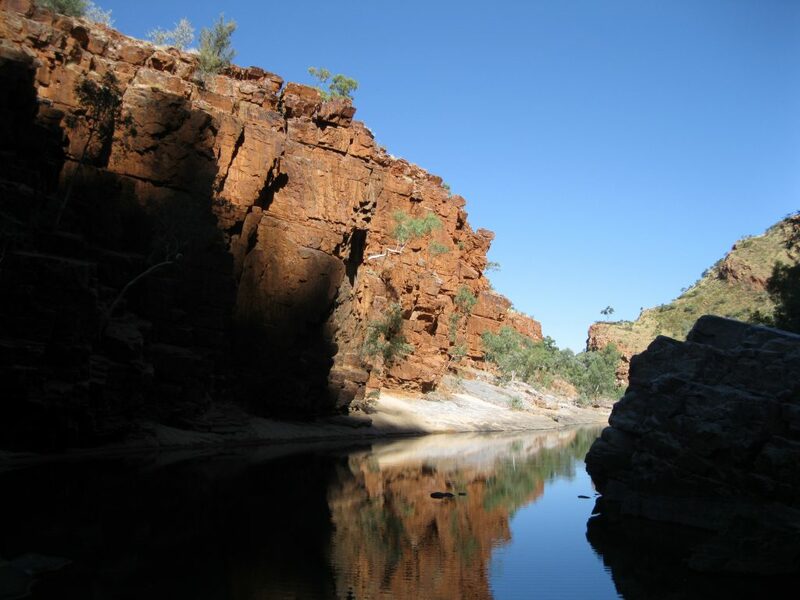 After you’ve checked out the lookout, walk back down and head into the gorge where you’ll find a small pool known as the Serpentine Gorge Waterhole. Also here you will have a great view and the possibility to get some great photos. 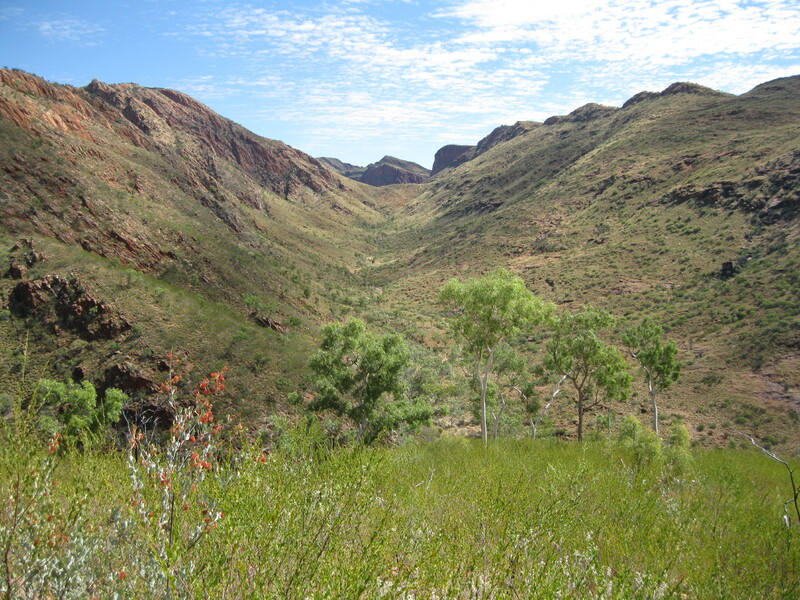 Serpentine Gorge is definitely one of the highlights along the whole Larapinta Trail. It is actually not official a part of the trail itself though. Section 8 is an awesome part of the Larapinta Trail which comprises of a total of 13 km (8.1 miles). 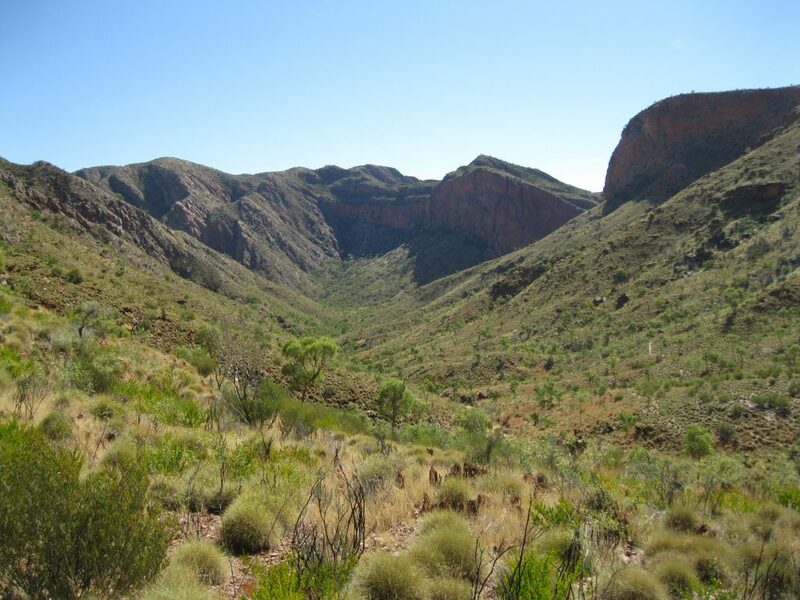 The hike starts at the Serpentine Gorge Carpark and heads towards the Heavitree Range which you will climb. It’s a bit of a climb but not too strenuous though. On the walk to the range you will have some stunning views of the range and as you get up on the range itself, the views will be even more spectacular with the Pacoota Range to the left, the Heavitree Range in front of you and the Chewings Range to the far right. The further you advance on the trail the more visible the Hidden Valley will become to your right. Absolutely stunning scenery all the way and it is recommended that you walk a bit off the track out to the edge several times on the trail, have a good look and take some shots. Be careful though. You can get some killer shots of the valley in both directs, where you are going to and where you came from. Note the amazing swirl rocks which are apparent on this trail. Really cool. Once you get to the sign of Counts Point straight ahead and Serpentine Chalet to the left, you have to do the last part of the walk to Counts Point which is right in front of you, up a knob that you will climb. Again, remember to check out the amazing Hidden Valley along the way by walking about off track and closer to the edge. When you have climbed the last hill you will be at the first major stop which is at Counts Point after 6.7 km (4.2 miles). The scenery at Counts Point is absolutely spell-binding. The view of the Hidden Valley is mesmerising and probably one of the best vistas on the whole Larapinta Trail. Stay for a bit, take in the view and take a lot of photos. The walk from the point where you climb the Heavitree Range to Counts Point is one of the most amazing stretches on the Larapinta Trail. When you have finished exploring Counts Point, you will head off the hill and return to the aforementioned sign. Also on the way back to the sign you will have amazing views of the Heavitree Range. Again there will be a lot of great photo opportunities. Keep your eyes open for wildlife. You may just be lucky and see a Central Military Dragon chilling out on a rock somewhere sunbaking on a rock. This dragon is found in Central Australia into big parts of Western Australia as well. It’s got bright sandy orange colour with a pattern of white and black spots down on each side of the back. The white spots sometimes form a long rough strip. The head and body length is about 7 cm (2.76 inches). It’s mostly found in sandy terrain, among spinifex but are often spotted on rocks. You can get pretty close to the dragon, but to respect its space and bear in mind that it’s very speedy and can escape in a split second. At the sign you will find a bit of shade so this will be a great spot for having lunch and a rest. After lunch you will be heading off the hill down towards Serpentine Chalet. On the way down there will also be loads of amazing views and opportunities for killer shots of the Heavitree Range and surrounding rugged ridges. So take your time. It’s a bit of a way downhill but it is not too strenuous if you are in good shape, then you will be down pretty fast. If you feel a bit uncomfortable heading down a rocky trail it will take you a bit longer. As you have descended from the hill the last part of the hike can be a bit hard, not due to the trail but because of the exposure in the sun after midday. Walk at your own pace keep hydrated and it’s all good. You will get to an interesting section shortly after the descent from the hill. With the exception of the bushes being the backdrop to this spot it looks a bit like a landscape from Mars. These rocks have been deposited randomly during floods and it’s an awesome contrast to the surrounding scenery. When you get to the end of the trail you should definitely check out the Serpentine Chalet Dam which is just a bit of the trail. The final bit of the walk up to the dam is pretty rocky and bouldery so be careful. When you get to the dam you will see a small pool and you may just be lucky and spot a hornet, as they hang around in these muddy environments. Climb further up the rocks to the top and you will have a great view of another part of the dam hidden in between the rocks. You will also be treated to great vista down the rock walls towards the Pacoota Range. Section 9 is a big and challenging day of 28.6 km (17.9 miles). As this is a long walk it is recommended that you start early just before sunrise so you don’t get into camp too late. The day begins at Serpentine Chalet Dam with a 2.3 km (1.4 miles) walk down to where Inarlanga Pass starts. 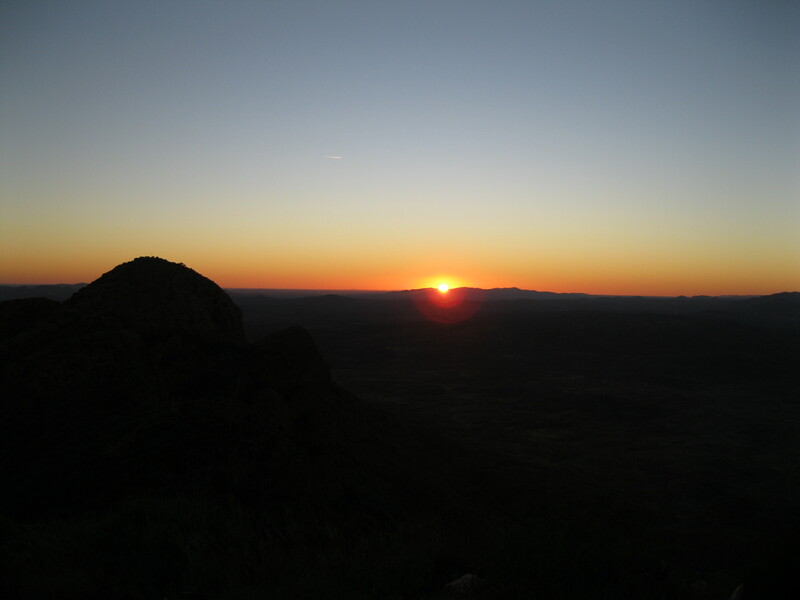 You will have some beautiful views of the different peaks of the Heavitree Range just before sunrise and at sunrise with the sun reflection on the top of the peaks as a magnificent contrast to the lower part of the peaks which is still in the dark. You can get some awesome shots at this time of day. As you continue on, you will be entering the Hidden Valley which is just stunning also with the way the sun is reflecting into the valley. Remember to look back to where you came from as the view is fantastic in that direction as well. The scenery all the way through the valley is just amazing so you can take several killer photos of how this grand valley changes the further you get in. As the sun has risen it will be even more apparent. You will get some views of the peaks that are perfect photo opportunities of the massive sheer rock walls. After about 13 km (8.1 miles) you will turn to the right, head further on to the Heavitree Range and towards Waterfall Gorge. At about 13.3 km (8.3 miles) you will be at Waterfall Gorge as per the official literature. At the Waterfall Gorge sign there’s a sign right next to it saying 14 km (8.75 miles). But who’s counting. Waterfall Gorge is a nice spot to have a break and a snack after a long hike so far. The place is a pretty cool rock wall and dried out waterfall during winter season. As you continue you will start climbing the Heavitree Range. On your way up you’ll get so amazing views of the range but this is also the most challenging climb on the whole Larapinta Trail. So you will have to concentrate on getting to the top of the ridge. Just do it at your own pace and take your time. When you get to the top you should definitely have a breather again as it is a tough climb. 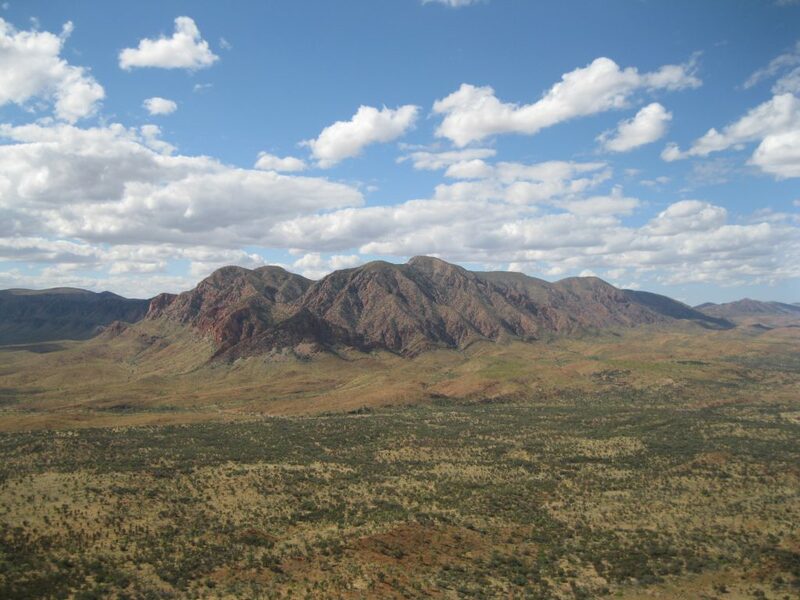 This is one of the most stunning views you will have on the whole Larapinta Trail with amazing vistas of the Heavitree Range, the Chewings Range, Mt Giles and Mt Sonder in the distance. Lookout area is pretty big so you can spend a lot of time up here checking out the scenery that surrounds you. Nothing less than amazing. The trail continues down the ridge on pretty rocky terrain. You have to be aware of the meat eating ants which there will be plenty of in this area. So try not to stand on top of an ants’ nest as they will attack you pretty fast. They bite and are pretty hard to get off your boots and socks. As you head down about a kilometre you will find a nice spot in the shade where you can have lunch and a well-deserved chill. After lunch the hike continues further down the ridge to when the trail starts heading off the hill down to the Base of Hill. Be prepared for a bit of a rocky hike but not too bad. Check out the surrounding scenery on the way and remember to look back at where you came from as well as it’s pretty impressive. As you get to the Base of Hill you should have a short break. You will most likely bit a bit tired as it’s been a long day and you’ve been walking during a hot time of day after lunch for about 4 km (2.5 miles) on rocky terrain. The final part of the walk is on pretty level surface with some climbs along the way. It’s not too challenging as such but it will feel a bit hard after a long day and it will most likely be pretty hot and it is a stretch of 8.6 km (5.4 miles). There will be a lot of beautiful vegetation, rolling hills and the Heavitree Range to your right on this final part. Keep an eye out for the pretty Mulla Mulla flower. When you finally get down to the sign for 28 km (17.5 miles) you will be close to the end of the trail. Section 10 is an easy and chilled day which is good after the hard and long Section 9. The walk is 9.1 km (5.69 miles) long on pretty level terrain. 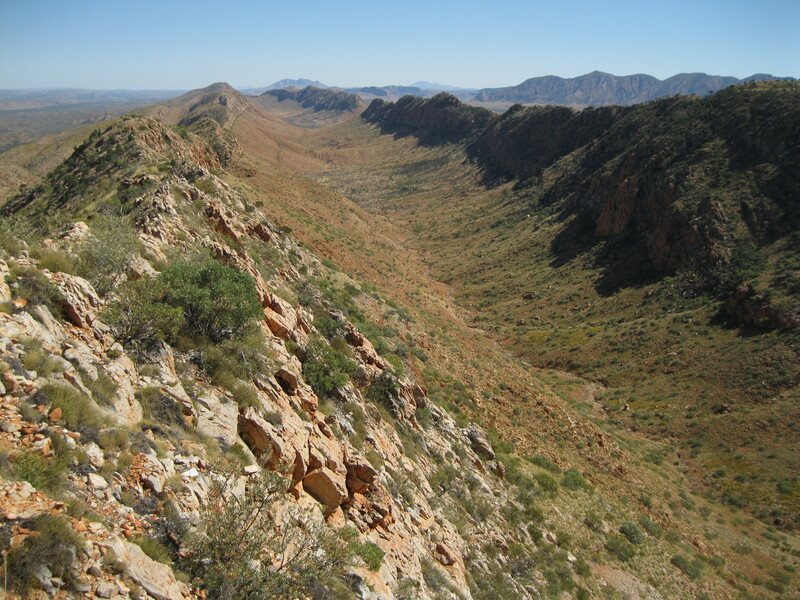 The trail starts at Ormiston Gorge where you will have view of Mt Sonder in the distance. You will stroll along among rolling hills, cross a creek and in no time you will be at the Hilltop Lookout after 5 km (3.1 miles). As the trail is so easy in comparison the day prior and other days you will on the move fast. At the Hilltop Lookout you can have a short breather, a snack and check out the view. You can still see Mt Sonder in the distance. As you continue the view of the ridge and gap at Glen Helen Gorge comes into view which is a red rock wall in the distance. You will get to Ormiston Creek which is a cool place to check out so have a break here was well. This creek is so big it may actually have a bit of water in it during winter. A lot of these creeks as they are called are massive and look a lot more like rivers. While you’re at Ormiston Creek you may note that high up in some of the trees you will see grass and branches, like 3 metres (9.8 feet) about ground level. It has been deposited there during a flood in summer. It will show you how high the water level was which is pretty amazing. You can get some neat shots here. As the hike continues you will cross a hill and then get to Finke River which is mostly dry. The walk continues down the river and it is pretty cool. So fascinating with all the bushes, gum trees and even really impressive rock formations based right on the river. Plenty of opportunities for great photos here as well. At the end of the river you will get to a waterhole which is a very nice place to have a dip. It’s going to be cold but is so refreshing. Afterwards you can chill out at the bank which is like a beach and check out the bird life. You may very well spot a couple of white-necked herons in a tree, sitting on a branch or flying around. Very cool and so peaceful. A great end to the day. Section 11 is a 26 km (16.25 miles) walk with a far bit of elevation so you can chose to split it into two days and camp about half way through at Rocky Bar Gap. The day starts at the Finke River and as you walk along you will be on easy level terrain with a good view of Mt Sonder straight ahead. After about 3 km (1.9 miles) you will get to Davenport Creek which is one of the few creeks that has not dried out. This is a great spot for a chill and you may spot a white-necked hanging out on a tree branch here if you are lucky. This is actually also a good place to play with skipping stones. 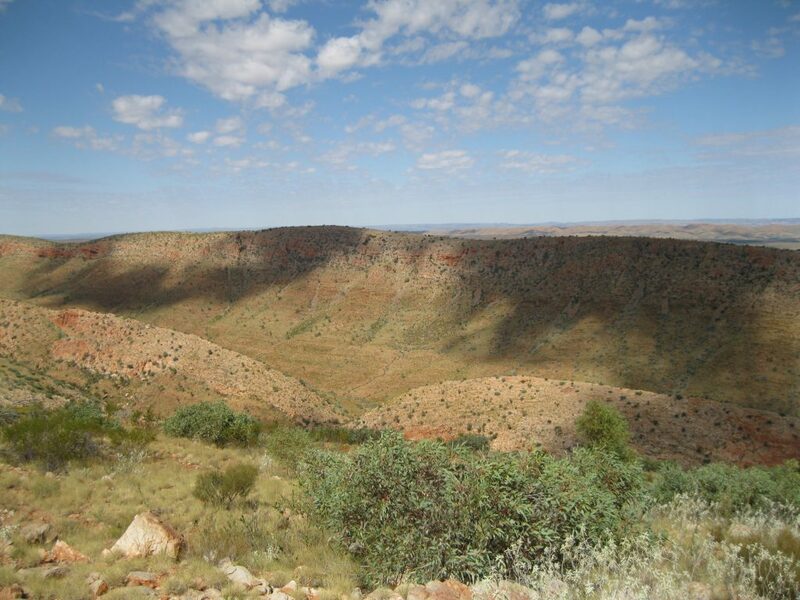 From here you will continue on to the Heavitree Range through the Mereenie Valley through easy terrain. Keep our eyes open. You may just spot a grasshopper in the bushes. Furthermore, check out the vegetation. You will most likely pass the Curry Wattle on the way which as the names suggests has an awesome curry scent to it. This plant is scattered across the in Central Australia and northern inland parts of Western Australia and Queensland. It grows in sandy and stony soils and on rocky slopes. It is one of the tropical acacias which leaves are spaced whorls around the stems. 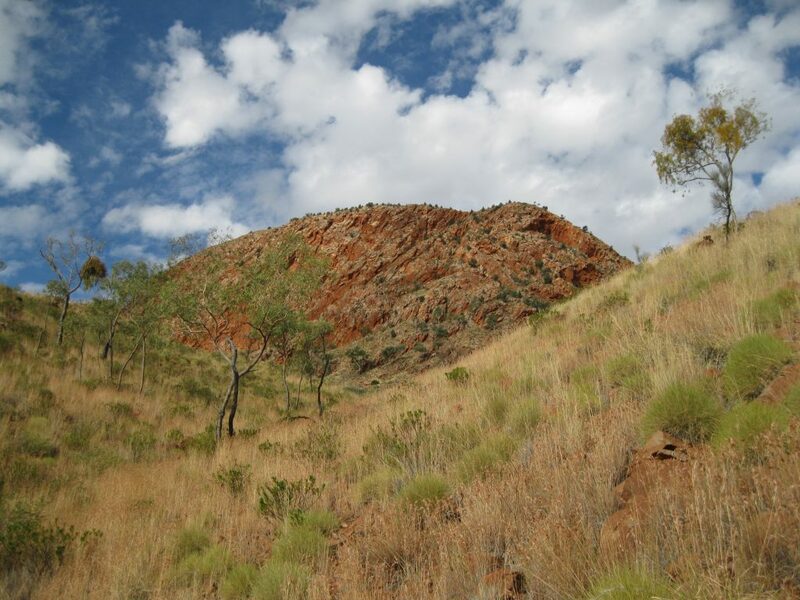 When you get to the Heavitree Range you will start climbing the hill which is not too strenuous. You will have great views all the way up and especially when you get to the top of the hill you will be approached by a magnificent rock wall just on the other side of the hill. Really stunning. As you carry on you can get some great shots of the rock wall from different angles and straight ahead Mt Sonder will appear nearer. After a bit you will get to the Hilltop Lookout. This is a great place for lunch if you are only doing half of Section 11. At the look out there is a stone chair constructed. You can get a great photo of yourself in the chair. You will have a perfect view of Mt Sonder from here which is awesome. 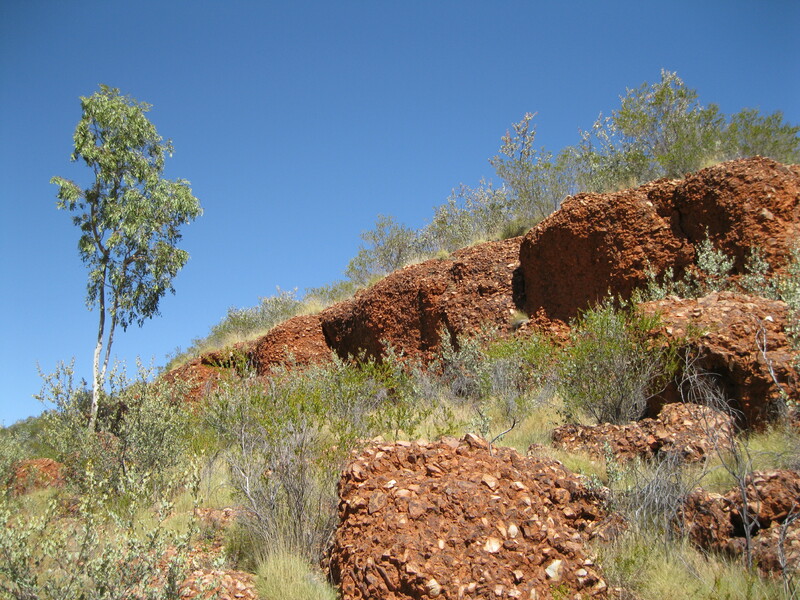 While you are at the Hillstop go through the bushes off trail in the direction you came from and just beyond the vegetation you will have a magnificent view of the rock wall from earlier and the Heavitree Range as well. As you descend the hill you will get closer and closer to Mt Sonder and there will plenty to great opportunities to photograph this magnificent mountain on the way. When you are off the hill, find a little spot in the shade where you can have a rest and a snack. Continue onwards and you will be crossing a creek bed with a view of both Mt Sonder and Rocky Bar Gap which you are walking towards. After 14.2 km (8.9 miles) you will be at Rocky Bar Gap where you will be walking through a big creek bed which will be a bit of a strain on your feet but it’s not too bad. You may just spot the bush lemon in this area. It is also found in other parts of the park. It’s pretty interesting fruit. It looks exactly like a lemon but it is very sour and more or less inedible. 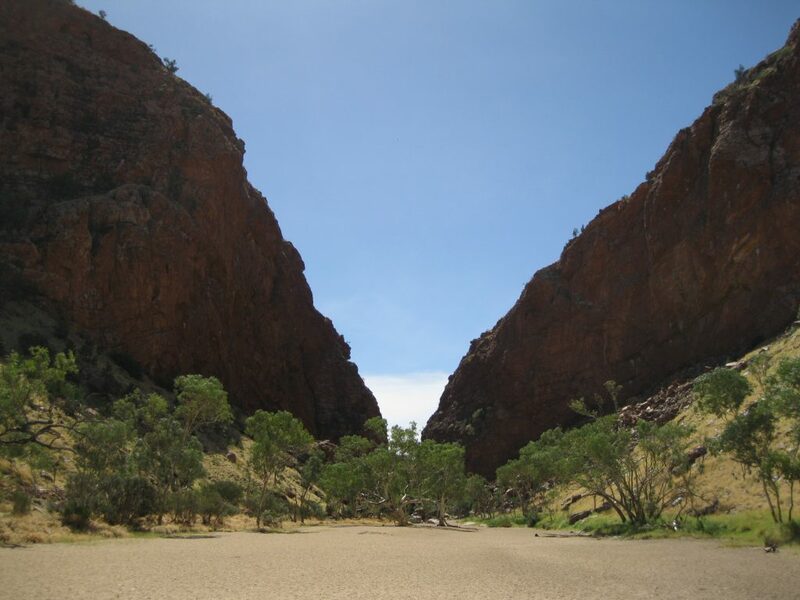 You can chose to camp at Rock Bar Gap or continue onwards and do the last 11.8 km (7.4 miles) to Redbank Gorge. As you continue on the trail you will have Mt Sonder to the right all the way as you are back in the Mereenie Valley. This last part of the trail is not strenuous and it is on a pretty level surface all the way. Keep your eyes open. You may just spot another grasshopper or other wildlife. Also note some cool black rock on the ground. These are compressed stromatolite which is some of the oldest rock in the world. The stromatolite at Hamelin Pool on the Western Australian coast is not compressed. Really awesome. Further on you will pass a cool rock on the trail with a hole through it. A very interesting rock which is made of siltstone/mudstone. Just before getting to Redbank Gorge you will cross Davenport Creek yet again which is an awesome lunch if you have split the section into two otherwise it’s just a good spot for a chill. The trail down to Redbank Gorge isn’t officially a part of the Larapinta Trail, but you should definitely head down to the gorge which is the highlight of the day. You will be walking down a sandy trail and a creek bed of small rocks and boulders. View towards the gorge is amazing so be sure to take for photos to perpetuate the memory. When you get to the gorge you will have a great view of the gorge and the pool. This is a perfect opportunity to have a dip. Just bear in mind that it will be cold but very refreshing. This is probably the coldest pool in the park. As you get in you can have a swim to the rock wall just opposite and back. When you are finished you have to walk back through the trail you came from and out to the Redbank Gorge Carpark which is just around the corner and Section 11 is concluded. Section 12 and the final section of the Larapinta Trail is a very special part of the trail. This is the day you will hike all the way to the top of the backbone of Mt Sonder. The real peak is not accessible, it’s too dangerous to climb and the Aboriginal people don’t want people to ascent it for cultural reasons either. It can be seen from the peak you will be ascending. It is recommend that you leave very early in the morning so you will arrive on top of the mountain for sunrise. When you get up to head off in the morning obviously depends on where you are camping. You should probably arrive at the Redbank Gorge Carpark to initiate the walk at 03:30 in the morning. Remember to bring gloves, a beanie, an extra long-sleeved top, an additional windbreaker top which could be a rain jacket all for when you arrive on top of the mountain where it will be cold. You could wear the long pants when you start the hike as it will be a tad cold in morning as well. Furthermore you have to bring a good head torch and additional batteries as it will be dark in the morning. There will be a lot of elevation on this part of the trail but it is not too bad as the trail is well marked and maintained and the temperature will be low when you head off early in the morning. The climb is 1,380 metres (4,528 ft) and the total return hike is 15.8 km (9.9 miles). The first big stretch will be from the carpark to the Saddle with an elevation of about 1,000 (3,281 ft) over 2.3 km (1.4 miles). When you get there have a short break and carry on along the ridge on the way to the very top of Mt Sonder. The final part is longer with less elevation. It will be 5.6 km (3.5 miles) with an ascent of 380 metres (1,247 ft). You will be surprised how fast you will get to the top as it’s not too hot and as the sun hasn’t risen you will not spending time on checking out the views on the way up. When you arrive at the very top of the mountain you will most likely have to wait a bit for the sun to rise. 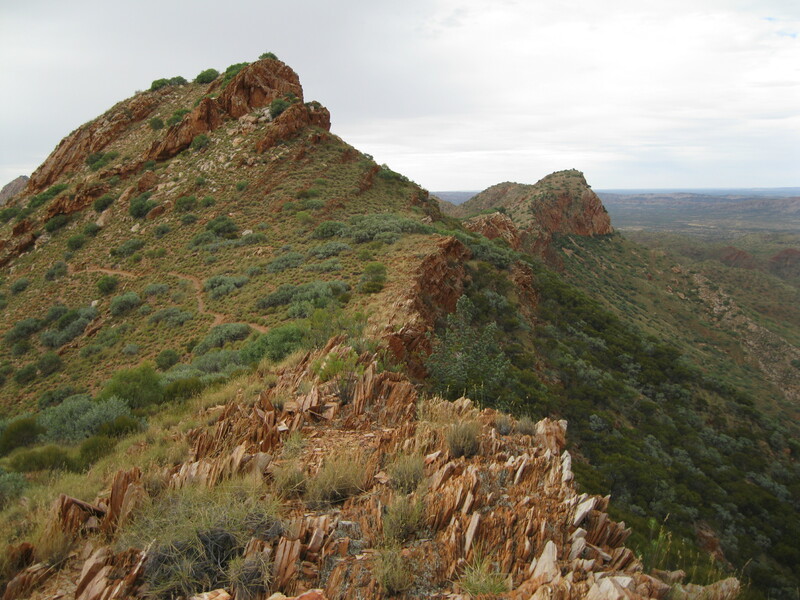 There is a cairn marking it as the highest point of the Larapinta Trail. It’s a good idea to bring a pot of coffee and some biscuits as you wait for the sunrise. The sun will rise beyond the actually peak of Mt Sonder so you will have a fantastic view of the sun rising behind this peak. As the sun rises get ready with your camera and take some shots both of the sunrise but also of the Heavitree Range to your right which is a magnificent view and the colours will change on the range the more the sun rises. The Mereenie Valley and the Pacoota Range also to the right is an amazing view. To your left there’s a fantastic view of the Chewings Range. Take your time to take it all in. Absolutely awesome. There will also be a plague on a rock at the top showing where all the major sights are located in relation to the peak such as Alice Springs, Ormiston Pound, Mt Zeil, Gosses Bluff and so on. Have a bit of a walk around and take some shots from many different directions. When you are heading back it will be on the same trail as you arrived on. This time you will be able to check out the views as the sun has risen therefore the descent will be slower than the ascent. You will have awesome views of the ridge of Mt Sonder and all the surrounding scenery. The Saddle looks good and this is one of the places where you have to climb a bit again but it’s not too bad. You have many opportunities of taking killer shots on your way off the mountain. When you get to the bottom and to the very end of the trail close to the carpark you have completed the full Larapinta Trail hike. At the end of the trail you will find the sign to Mt Sonder. You could get a picture of yourself at the sign as aa testament to completing the hike. Congratulations on doing this awesome trek! 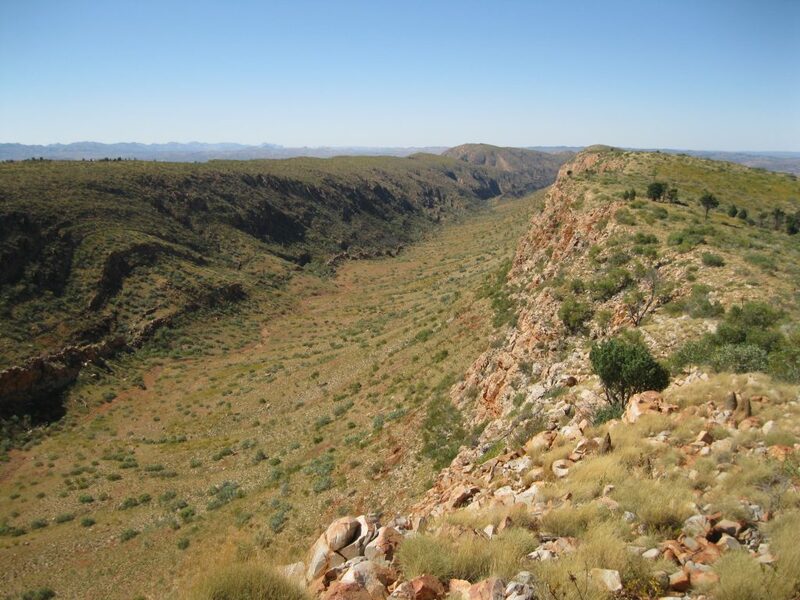 An absolute must and one of the highlights in West MacDonnell National Park is to explore Ormiston Gorge and Ormiston Pound. Do the Ormiston Pound Walks which is a trail of 7 km (4.4 miles) on pretty easy and mostly level terrain with the exception of a short climb to a lookout and a stretch over a creek bed. At around the end of the hike you will have to cross a small pool in the gorge, so you will have to bring either a pair of sneakers or sandals which you can wear when crossing. Something sturdy you don’t mind getting wet. The trail starts with a leisurely walk along the beautiful rocky slopes of the Heavitree Range until you’re about a bit less than an hour into the hike you will arrive at the point where you have to climb up to the lookout of Ormiston Pound. This is an absolutely stunning view and one of the best in the park. From here you can see Ormiston Creek and the gap in the mountain range across the pound is called Bowman’s Gap. It’s absolutely beautiful up here, so take your time. You can get some cool shots of the range and against the ridge on which you are standing, the ridges ahead of you and so on. As you make your way down from the lookout you will be heading into the pound itself. You will be amazed with the scenery here. The trail is really easy and you shouldn’t hurry through. You can get some fantastic photos of the surrounding hills and slopes in all directions. You will get to a massive creek bed which is Ormiston Creek. This is a good spot for a break and great for taking some photos of the amazing creek and the surrounding landscape. When you continue you will reach another part of Ormiston Creek and it may still be flowing. Also an awesome spot to check out in further detail. Cross the creek over a bit of plain to the gorge. This will be the most challenging part of the day, but it’s not difficult though. The beginning is on easy level ground and then you have to meander through a creek bed to get further into Ormiston Gorge. You will see massive red rock walls of the gorge ahead of you which is just an amazing sight. As you walk along you will be surrounded by the rock walls and the scenery will become more and more stunning. You can get some killer shots of the gorge and the massive rock walls up close. Very impressive. You will get to a section with a pond, continue to the left of it and around the bend, you will find the section where you will be crossing the pond. It depends on the season but it will most likely be about a metre (3.3 ft) deep. Take off you hiking boots, strap them to you backpack, put on your sneakers or sandals and cross the pond to the other side. You will have a great view of the gorge on the other side. You should be able to get some great shots of the rock walls with the reflection in the pond. As you head on you will be doing a bit of climbing across some rocks and the end of the hike is near. Along the way, look out for rock wallabies on the rock wall across the pond. When looking back you’ll have great photo opportunities as well. At the very end of the hike there will be a pool which is just perfect for a dip after a great hike. So refreshing and you can chill out on the bank afterwards as well. This area is also perfect for having lunch. 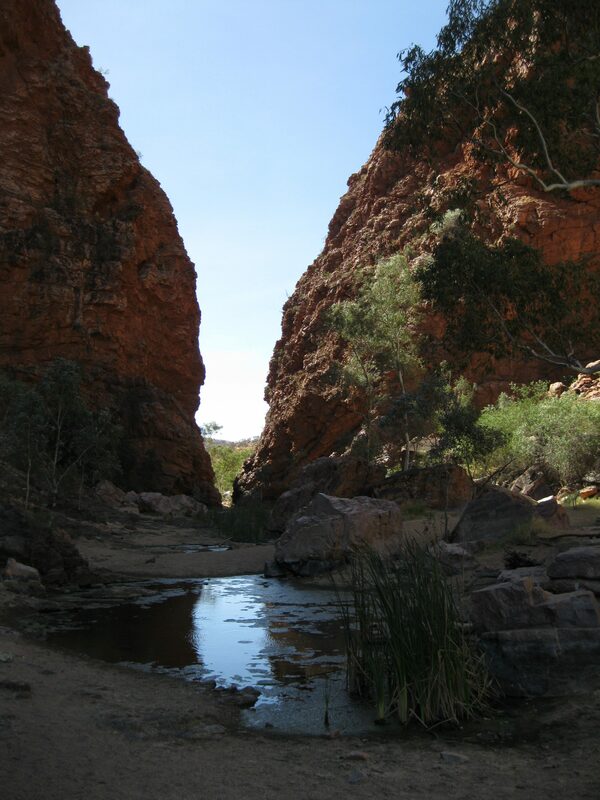 Another place you have to pay a visit is the Glen Helen Gorge. This is a beautiful place and is also the location of the so called Glen Helen Resort which is actually looks more like a caravan park. There is a little shop and a bar which is a cool spot to have a chill with a beer outside on the veranda with the gorge and a massive rock wall as the backdrop. Very impressive. There is a very encouraging sign at the bar saying “Outback Pub – drink more booze”. That’s a pretty fair statement. 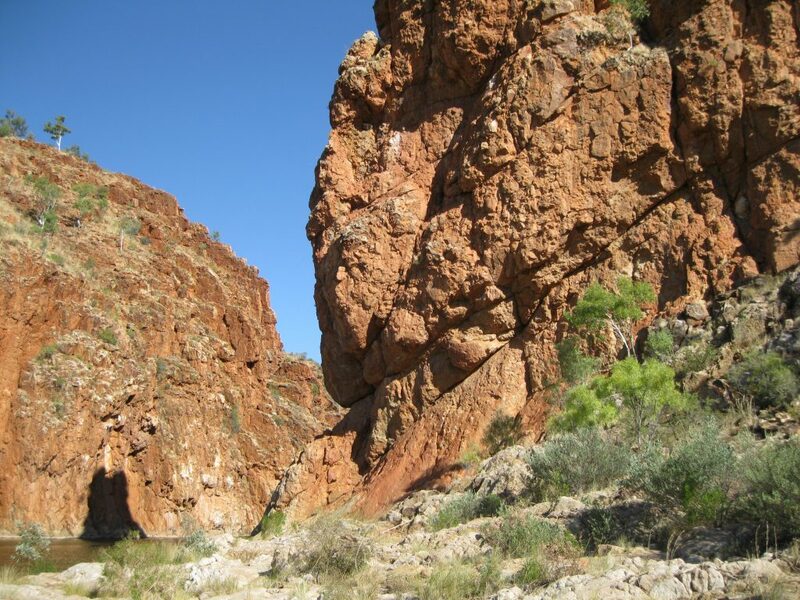 The most spectacular sight of the Glen Helen Gorge is the humongous rock walls on each side of the gap of the gorge. It such an amazing sight as you walk from the resort area towards the gorge and you are faced with this massive red rock wall. It’s pretty awesome all the way down to the pool at the gorge. You will have plenty of opportunities to take great photos. As you get to the end, the beautiful gorge comes into view. So cool. The rocky slopes of the gorge is the home of the one of the park’s largest concentration of Black-footed Rock Wallabies. The waterhole is also one of the small number of permanent waterholes along the Finke River. If you are lucky you may be able to see some of the interesting wildlife of the gorge such as nine different species of fish and herons. An interesting and different site in the park is the Ochre Pits. These are colourful and swirled soft-stoned and fragile cliffs that can be found 300 metres (984 ft) from the carpark area. It’s a very easy walk down a paved path to a view platform where you can have a look at this magnificent colourful earth. You can descend into the creek bed to have a closer look at the stunning colours of the cliffs. Remember like anywhere else in the national park, you are not allowed to take “a souvenir” with you. Due to the cultural significance you will be fined 5000 AUD if you remove or interfere with the ochre. The colours of these 10 metre (33 ft) high cliff walls are beautiful and it is an absolute must that you check out this area. It’s pretty small as the walk at the cliffs is only about 80 metres (262 ft) return so it will take you about 20 minutes to explore the area. The coloured earth has been used for ceremonies, dance, decoration and burial rites throughout Australia for thousands of years. 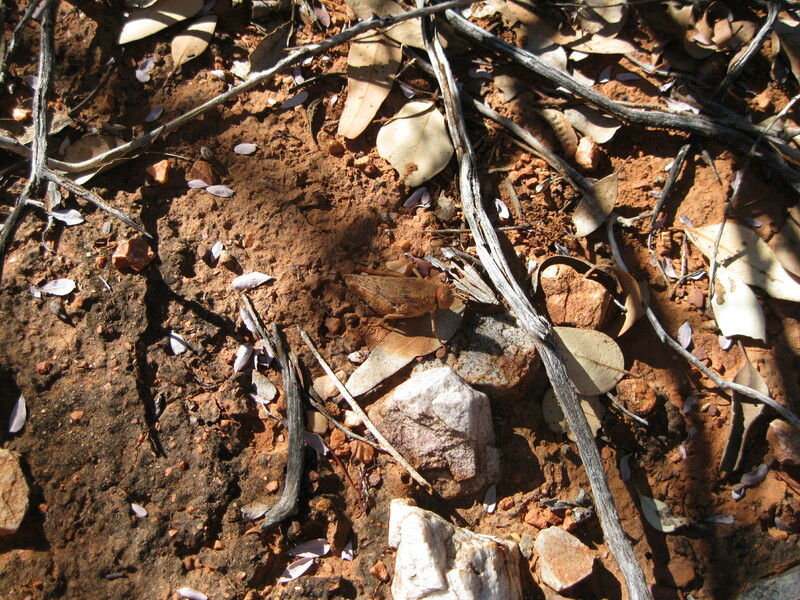 The ochre was also used for household and medical purposes by the Western Arrernte people. The ochre mixed with fat, grease or eucalyptus leaves was used to heal various ailments. 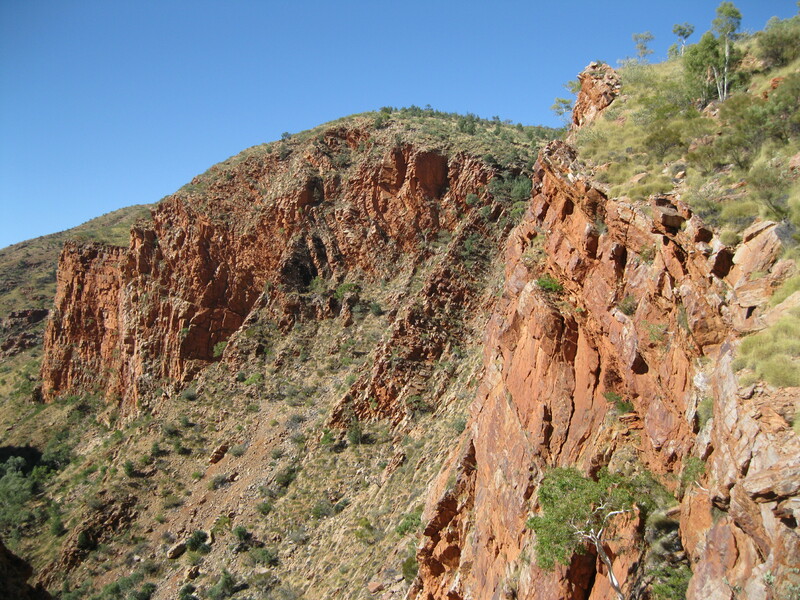 The cliffs stretch back 700 million years to a time when the MacDonnell Ranges were just a floor of a massive shallow inland sea that was the same size as the present day Mediterranean Sea. As the sea deepened mud and sand were deposited to a thickness of 10 km (6.25 miles) at the deepest point, known as the Amadeus Basin. This would be compacted to sold rock. 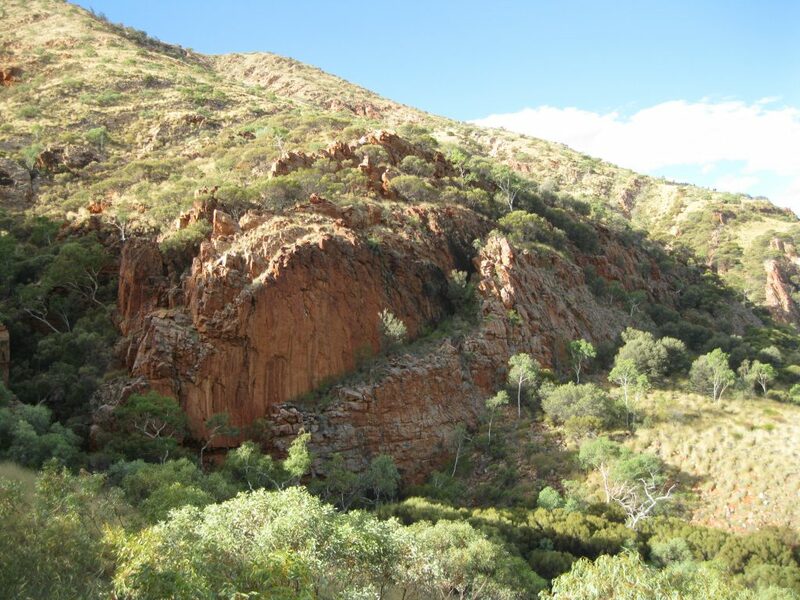 About 300 million years ago the earth heaved and rolled in a dramatic period of mountain building that pushed the MacDonnell Ranges to the height equivalent of the present day Himalaya Mountains. The sediments that had been laid down in horizontal layers were thrust up to the current almost vertical position. Wind and rain would over time carve into the vertical layers expose spectacular swirls and curves. The different coloured layers were the result of the presence of iron oxide in varying amounts. The more iron oxide would result and a darker and more red colour. The more white rocks has a lower or no presence of iron and high level of kaolin which is a white clay mineral.